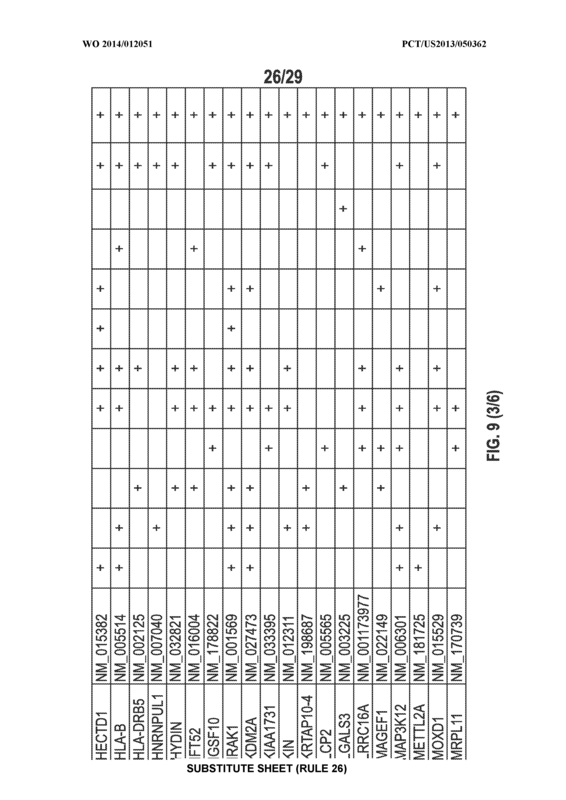 Cancer antigens containing mutations in an expressed gene of cancer cells from a cancer patient are identified. 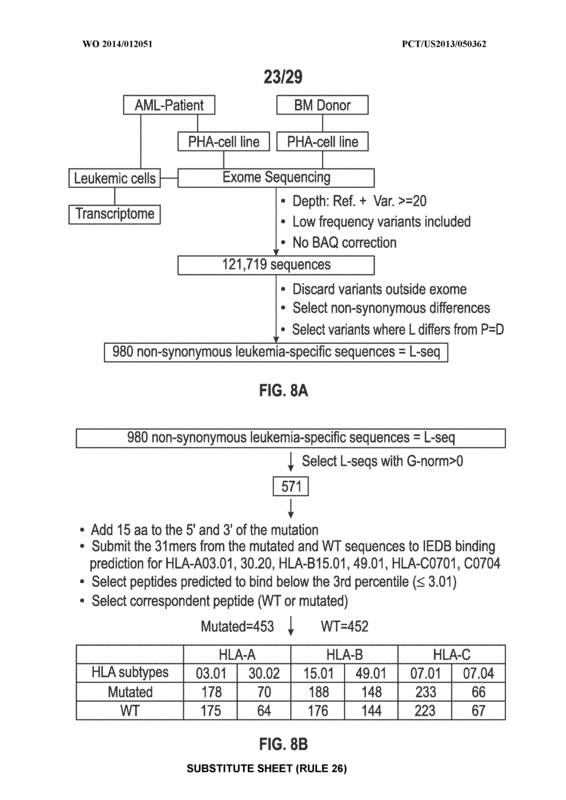 Sequences from cancer cells obtained using a parallel sequencing platform are selected by comparing to the patient's normal genes or to normal genes from an HLA-matched individual. 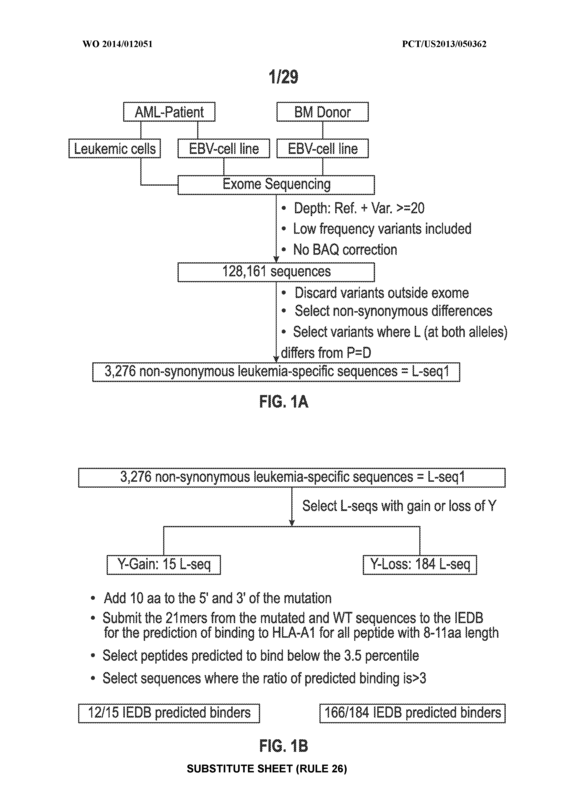 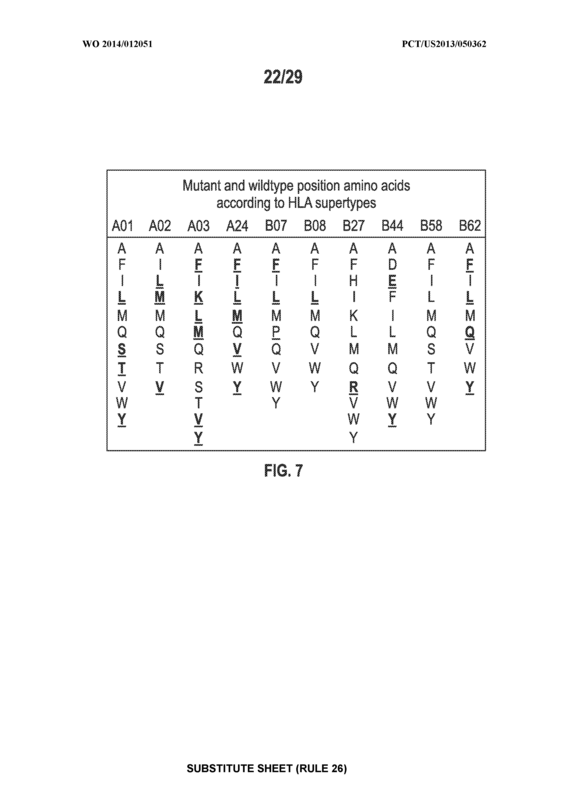 Sequences are further selected by identifying an HLA supertype of the cancer patient and selecting for that HLA supertype, sequences that have a particular amino acid at the mutant position and/or corresponding wide-type position in the effected gene. 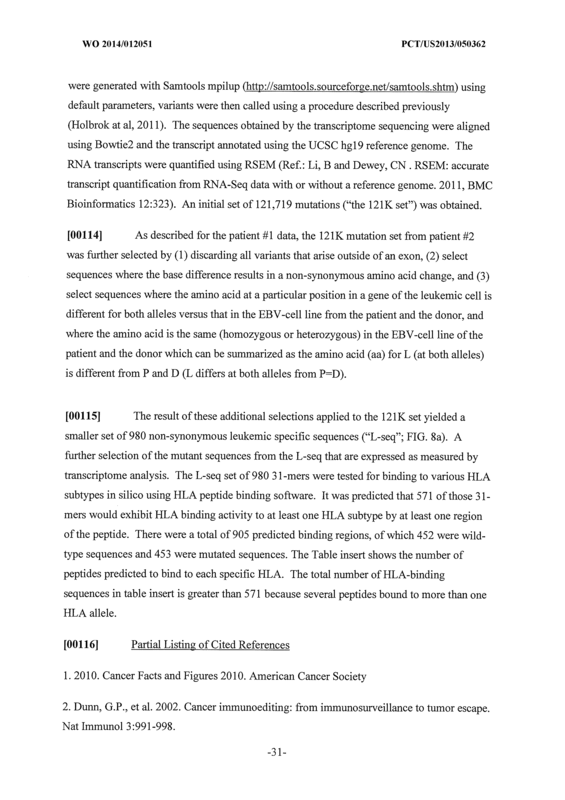 Peptides containing cancer antigens are optionally tested for binding to HLA antigens of the cancer patient. 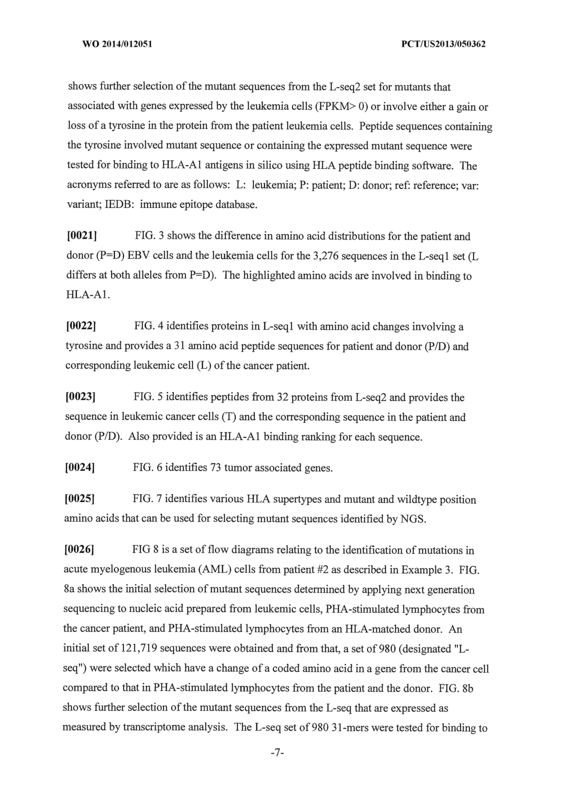 Peptides containing the cancer antigens are evaluated for activating cytotoxic T lymphocytes (CTL) cell lines from the cancer patient or from an HLA- matched donor. 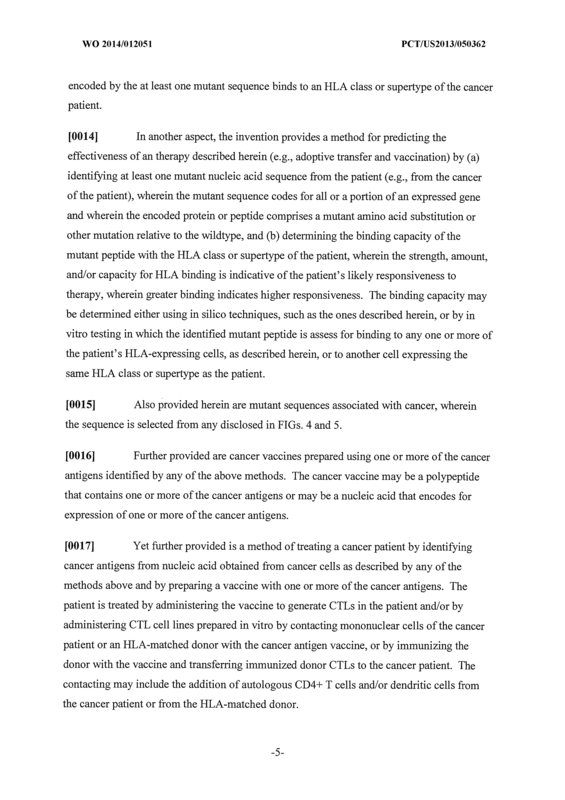 The cancer antigen(s) identified for a cancer patient are used to prepare a cancer vaccine and to treat the cancer patient. 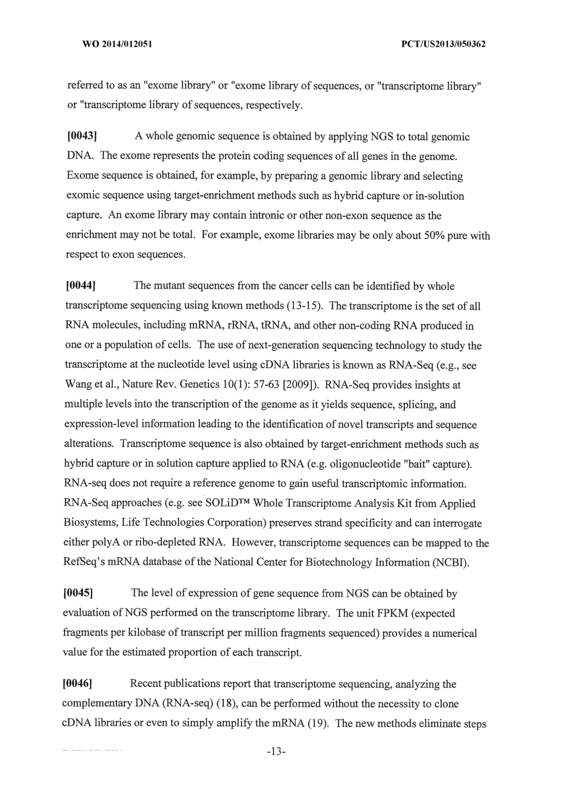 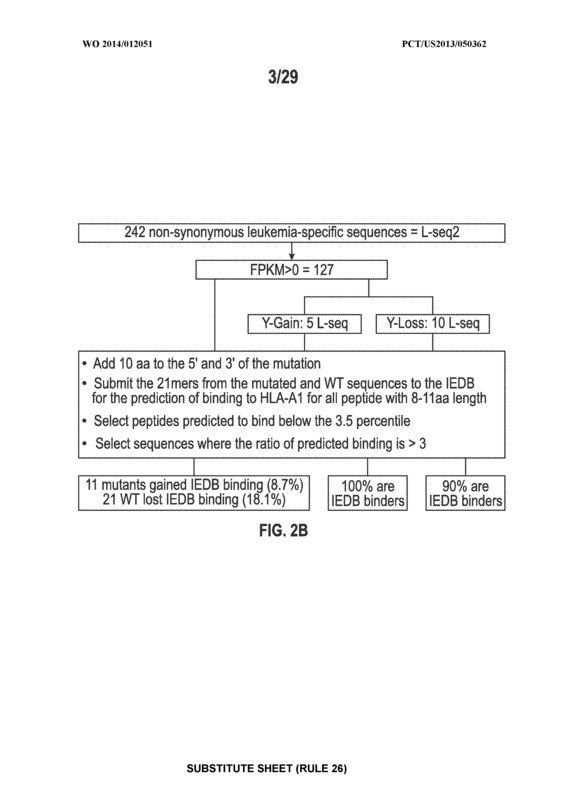 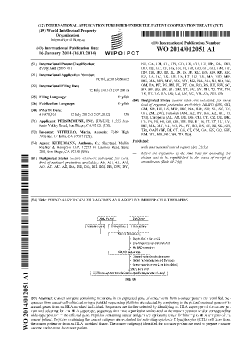 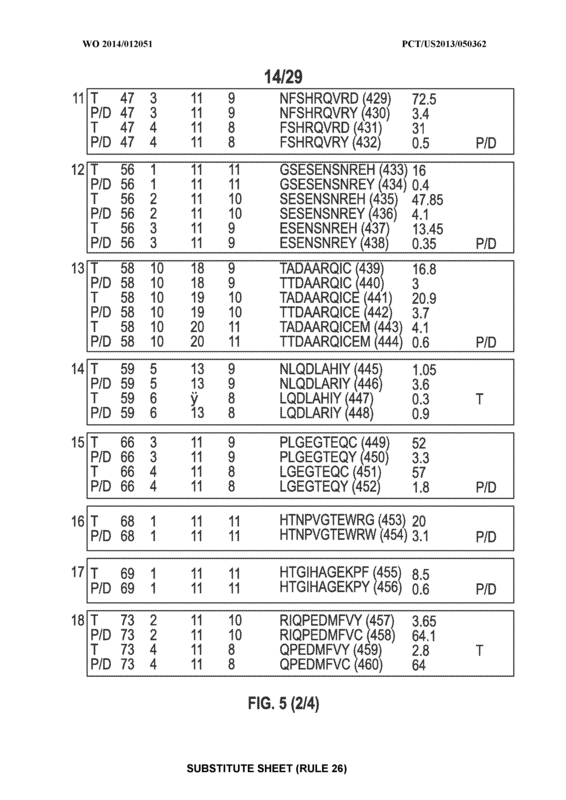 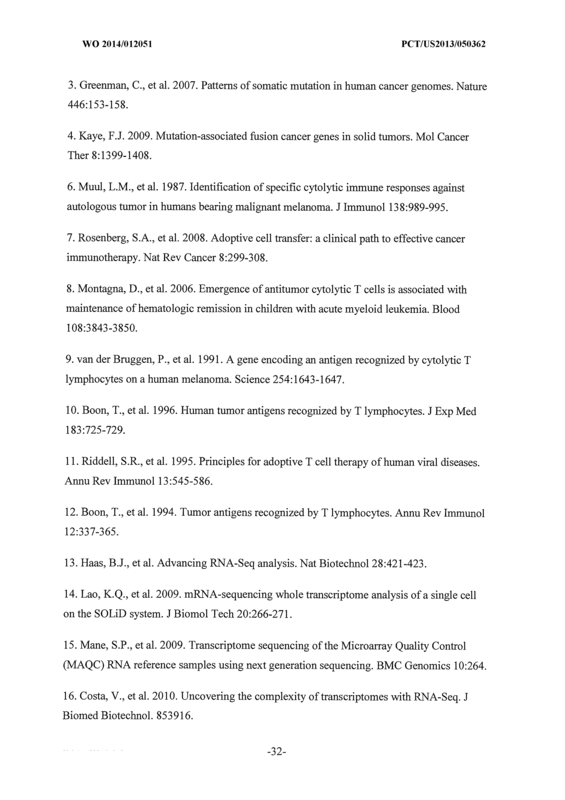 A method of identifying cancer antigens for preparing a cancer vaccine, comprising a) obtaining a plurality of mutant sequences from the nucleic acid of cancer cells from a cancer patient, said mutant sequences coding for all or a portion of an expressed gene and wherein the mutant sequences each have a mutant position amino acid which substitutes for a wildtype position amino acid located at the same position in the wildtype sequence of the protein, wherein said mutant sequences are obtained using a parallel sequencing platform, said parallel sequencing platform employing parallel processing of said nucleic acid of cancer cells leading to sequence reads and mapping of the sequence reads to a database with reference gene sequences; and b) selecting mutant sequences from those identified in step a) by identifying an HLA class or supertype of the cancer patient and then selecting an amino acid for said HLA class or supertype as the mutant position amino acid and/or wildtype position amino acid using FIG. 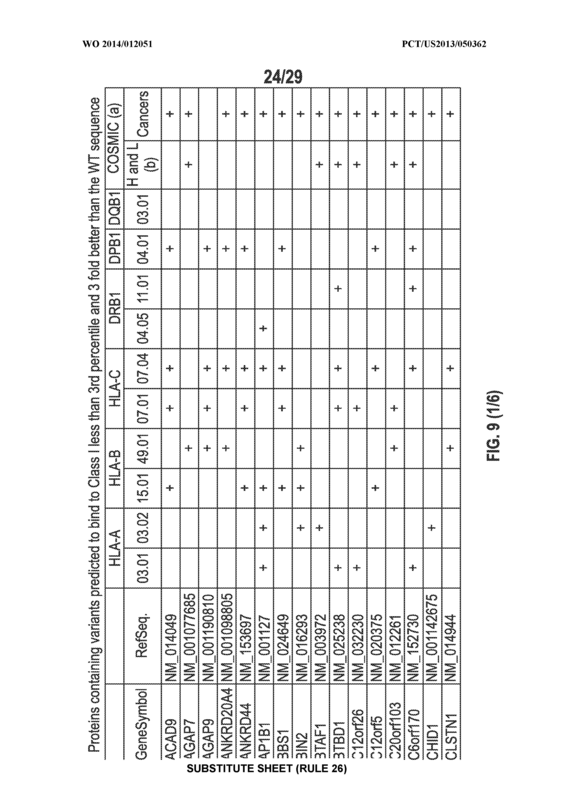 7, wherein cancer antigens for preparing a cancer vaccine are identified. 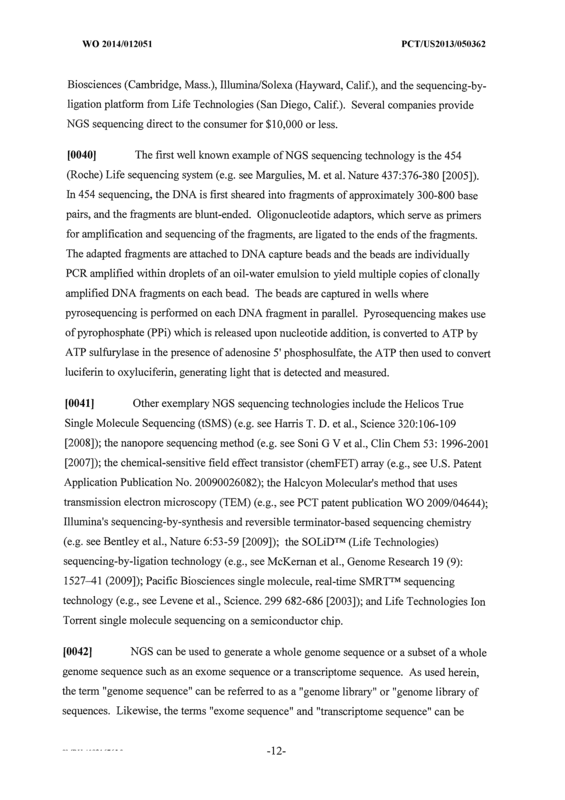 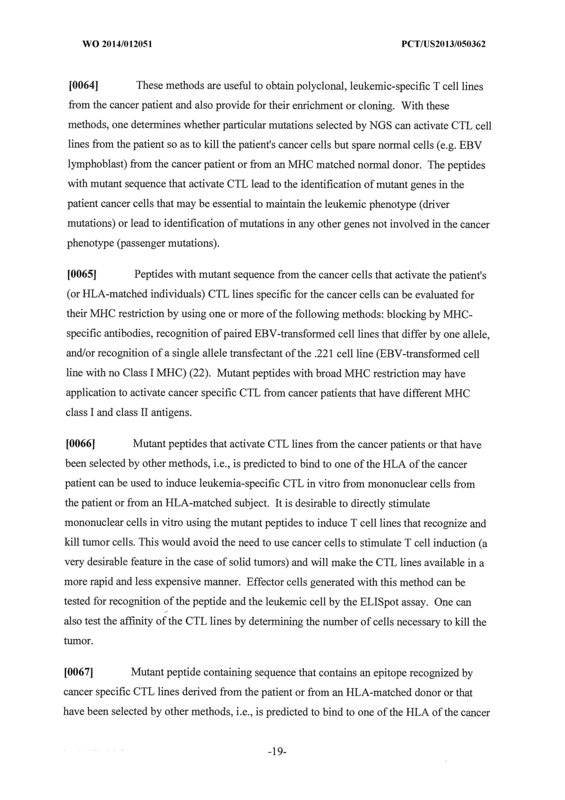 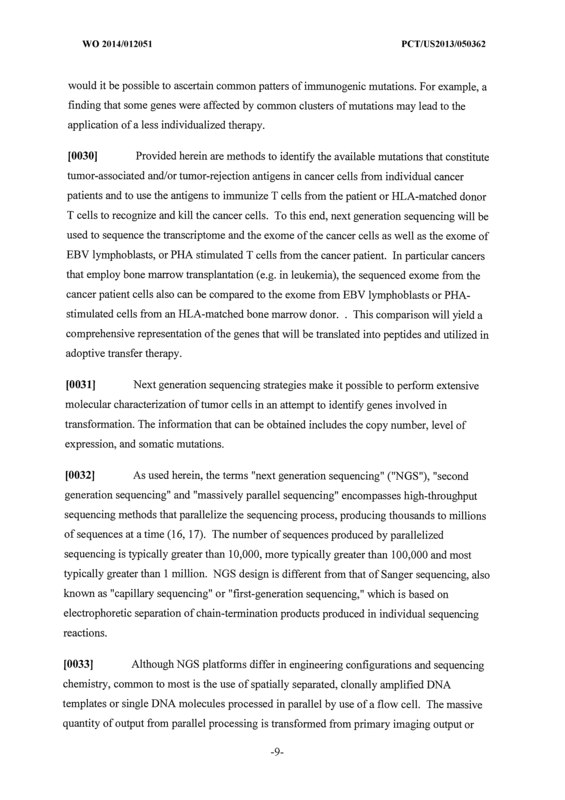 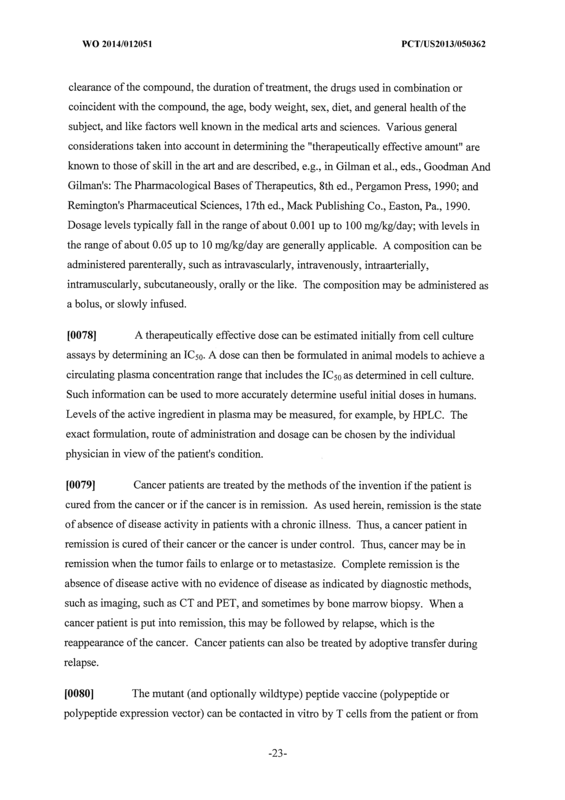 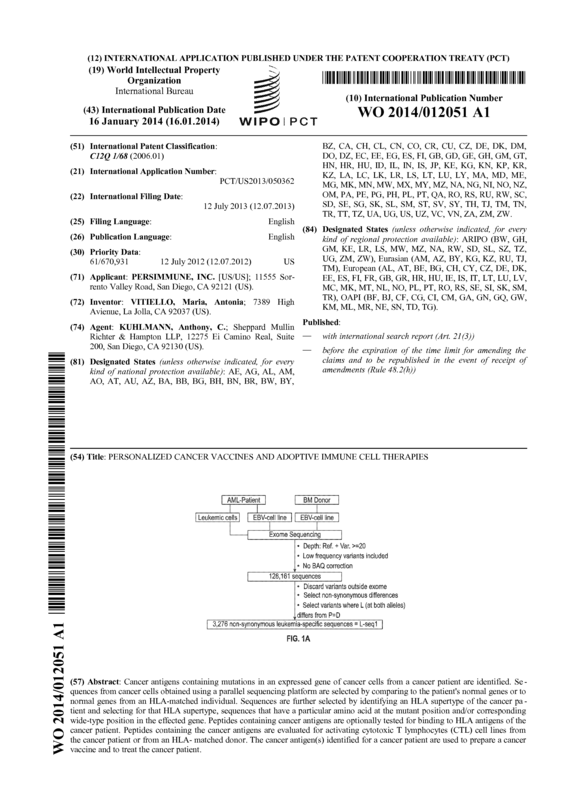 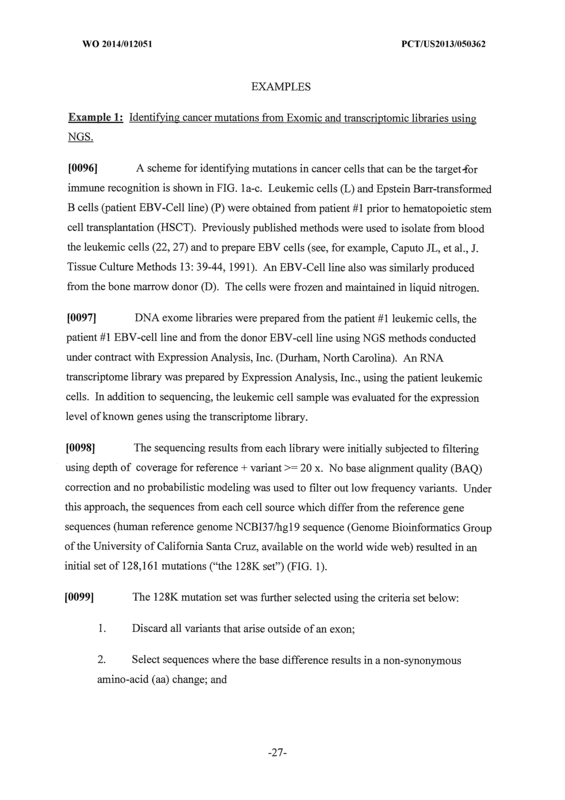 The method of claim 1, wherein peptides are synthesized comprising said mutant sequences from step b) and evaluated for activating cytotoxic T lymphocytes (CTL) cell lines prepared from the cancer patient or from an HLA-matched donor, said CTL cell lines obtained by contacting mononuclear cells from the cancer patient or from the HLA-matched donor with cancer cells from the cancer patient. 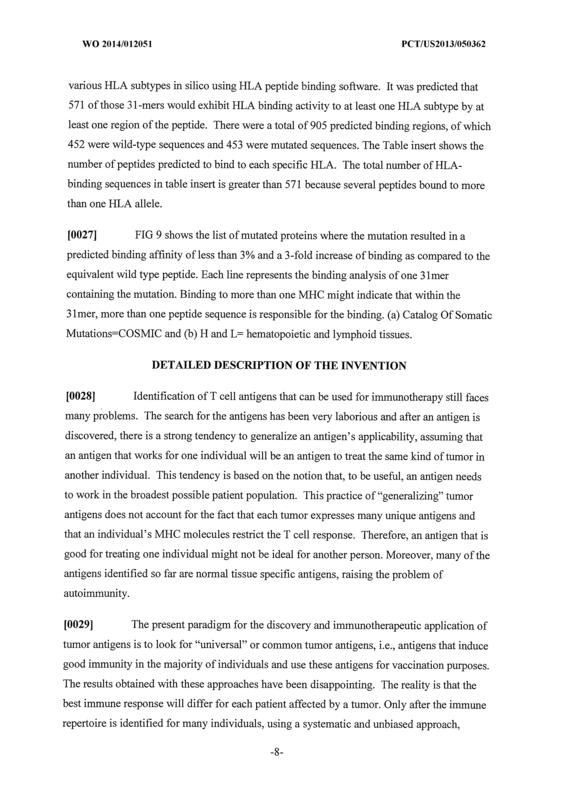 The method of claim 1, wherein peptides comprising the selected sequences from step b) are evaluated for their ability to bind to HLA histocompatibility antigens. 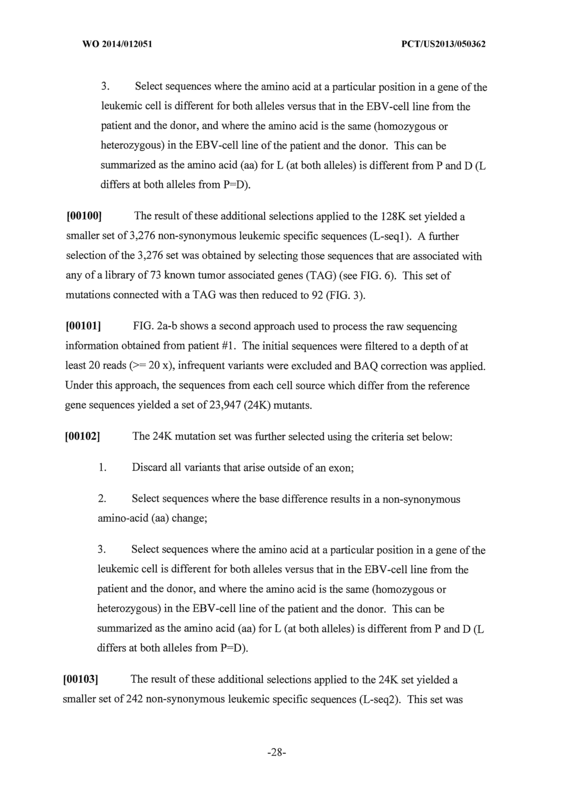 The method of claim 3, wherein the ability to bind to HLA histocompatibility antigens is carried out in silico using computer-based algorithm(s) for predicting HLA binding peptides. 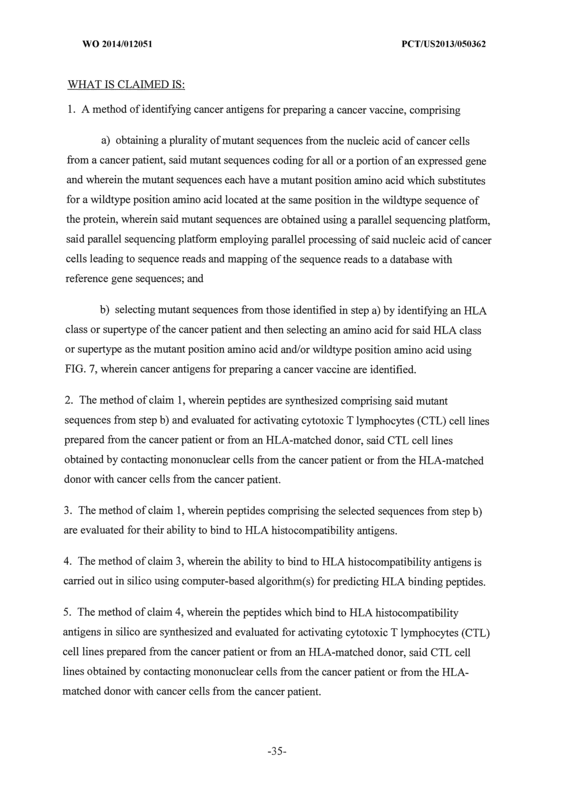 The method of claim 4, wherein the peptides which bind to HLA histocompatibility antigens in silico are synthesized and evaluated for activating cytotoxic T lymphocytes (CTL) cell lines prepared from the cancer patient or from an HLA-matched donor, said CTL cell lines obtained by contacting mononuclear cells from the cancer patient or from the HLA- matched donor with cancer cells from the cancer patient. 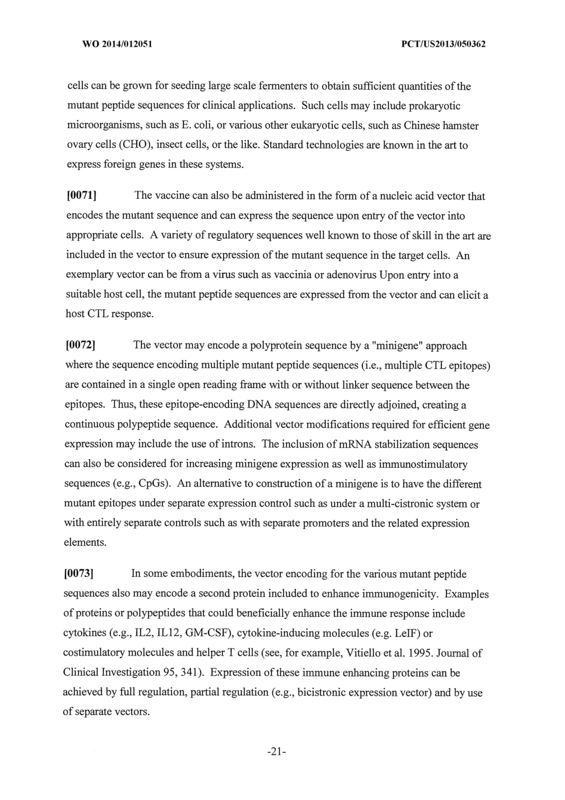 The method of claim 3, wherein the ability to bind to HLA histocompatibility antigens is carried out by synthesizing the peptides and testing them for binding to antigen-presenting cells that express HLA histocompatibility antigens. 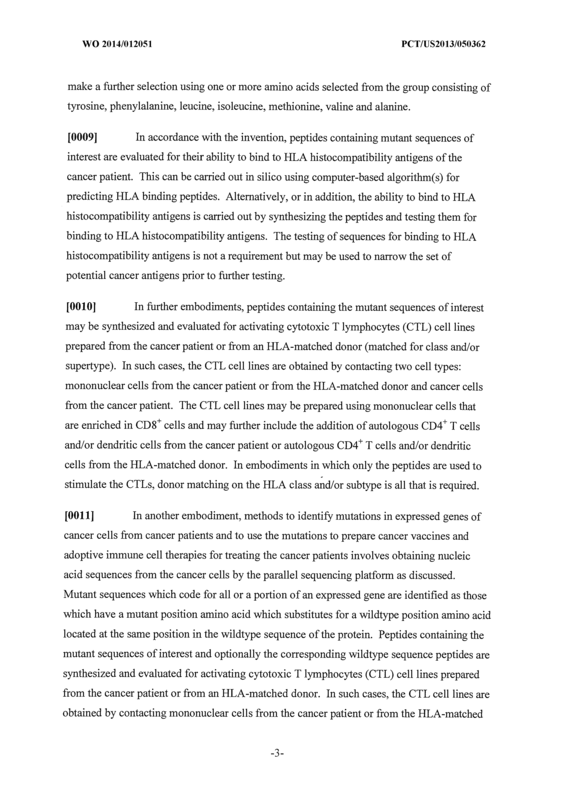 The method of claim 6, wherein the peptides which bind to HLA histocompatibility antigens are synthesized and evaluated for activating cytotoxic T lymphocytes (CTL) cell lines prepared from the cancer patient or from an HLA-matched donor, said CTL cell lines obtained by contacting mononuclear cells from the cancer patient or from the HLA-matched donor with cancer cells from the cancer patient. 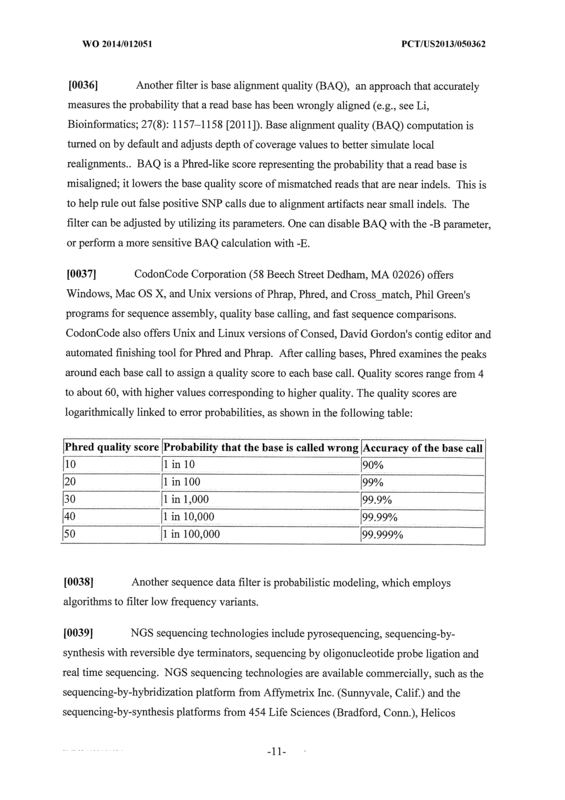 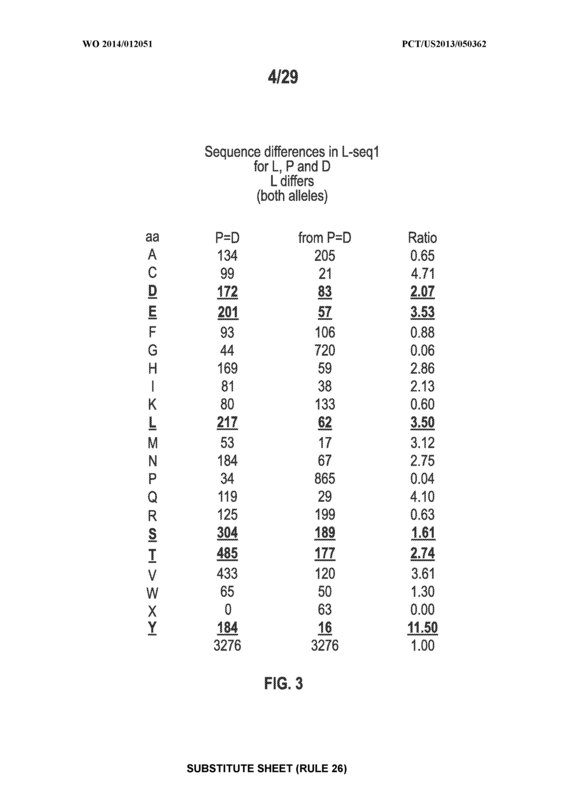 The method of claim 1, wherein said parallel sequencing platform filters the sequencing results using a depth of coverage less than 20 x and/or by not filtering with a base alignment quality (BAQ) algorithm. 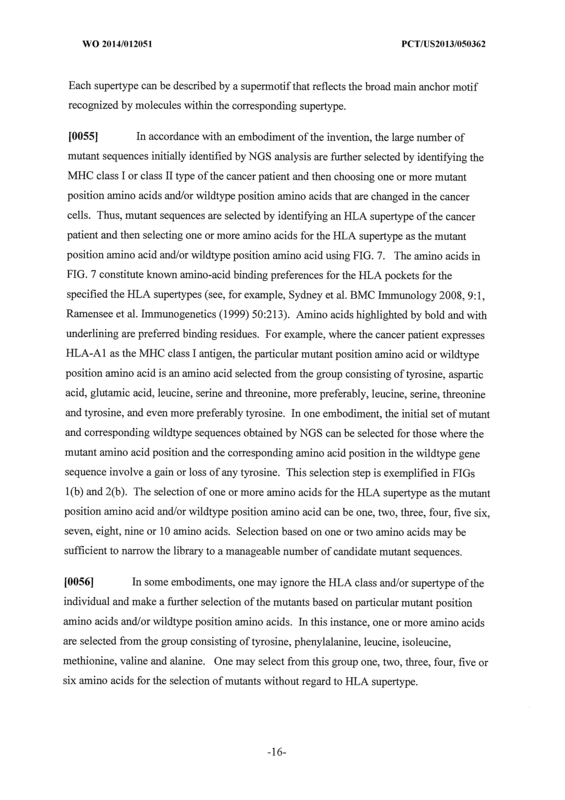 The method of claim 1, wherein the HLA class or supertype is HLA-1 and the mutant amino acid or wildtype amino acid is selected from the group consisting of tyrosine, aspartic acid, glutamic acid, leucine, serine and threonine, and wherein the cancer patient expresses the HLA-A1 histocompatibility antigen. 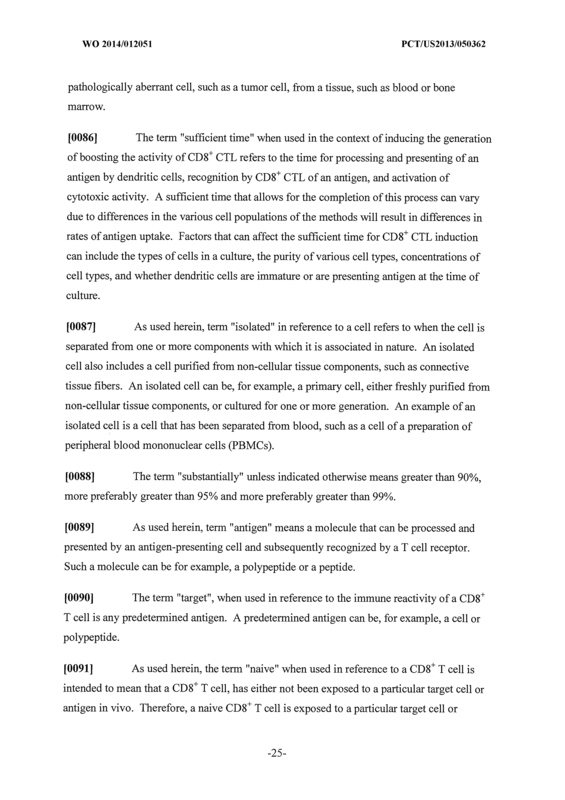 The method of any of claims 2, 5 and 7, wherein said mononuclear cells are enriched in CD8+ cells. 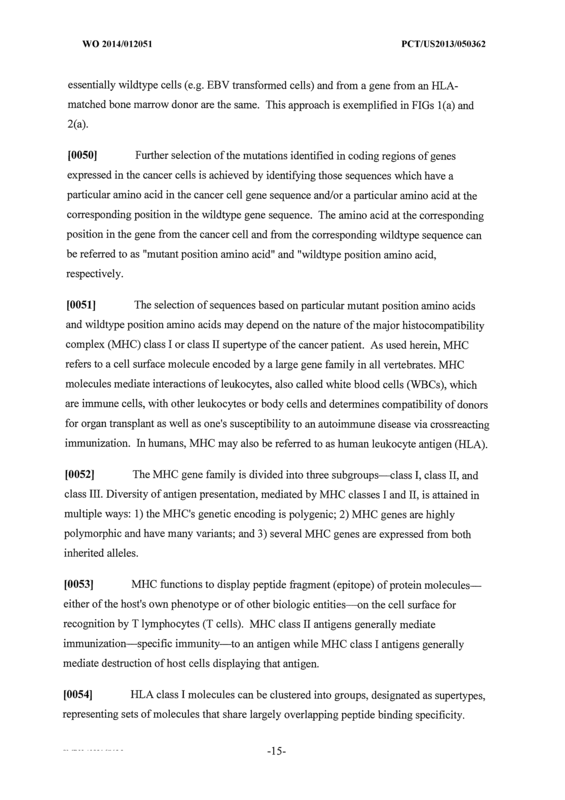 The method of any of claim 2, 5 and 7, wherein said contacting further includes the addition of autologous CD4+ T cells and/or dendritic cells from the cancer patient or autologous CD4+ T cells and/or dendritic cells from the HLA-matched donor. 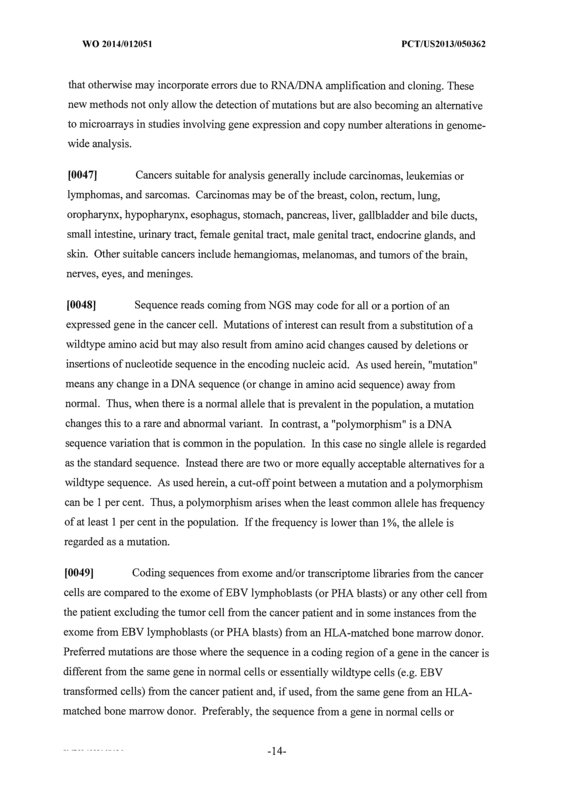 A method of identifying cancer antigens for preparing a cancer vaccine, comprising a) obtaining a plurality of mutant sequences from the nucleic acid of cancer cells from a cancer patient, said mutant sequences coding for all or a portion of an expressed gene and wherein the mutant sequences each have a mutant position amino acid which substitutes for a wildtype position amino acid located at the same position in the wildtype sequence of the protein, wherein said mutant sequences are obtained using a parallel sequencing platform, said parallel sequencing platform employing parallel processing of said nucleic acid of cancer cells leading to sequence reads and mapping of the sequence reads to a database with reference gene sequences; and b) identifying at least one mutant sequence for preparing a cancer vaccine from the plurality of mutant sequences obtained in step a) by determining that at least one peptide encoded by the at least one mutant sequence binds to an HLA class or supertype of the cancer patient. 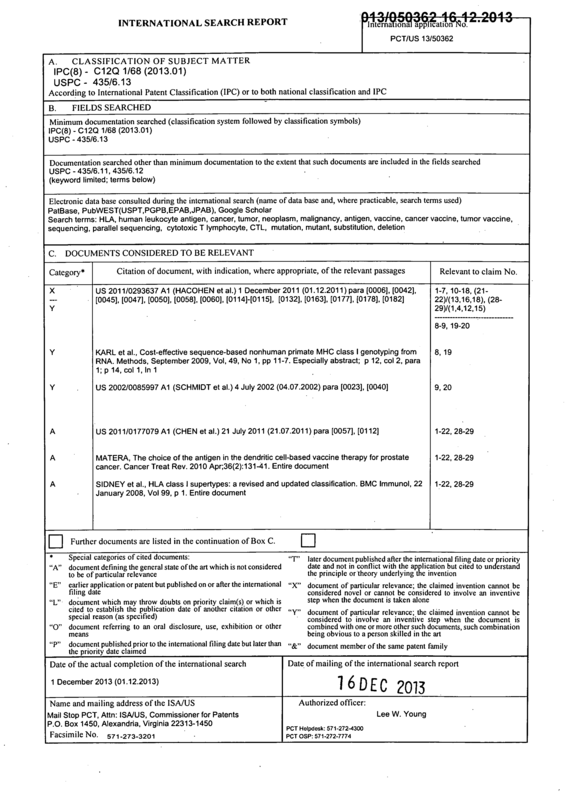 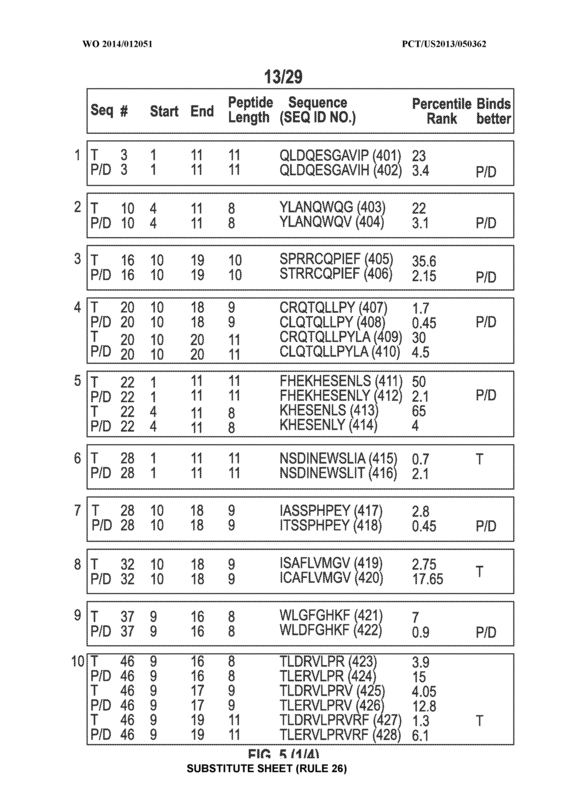 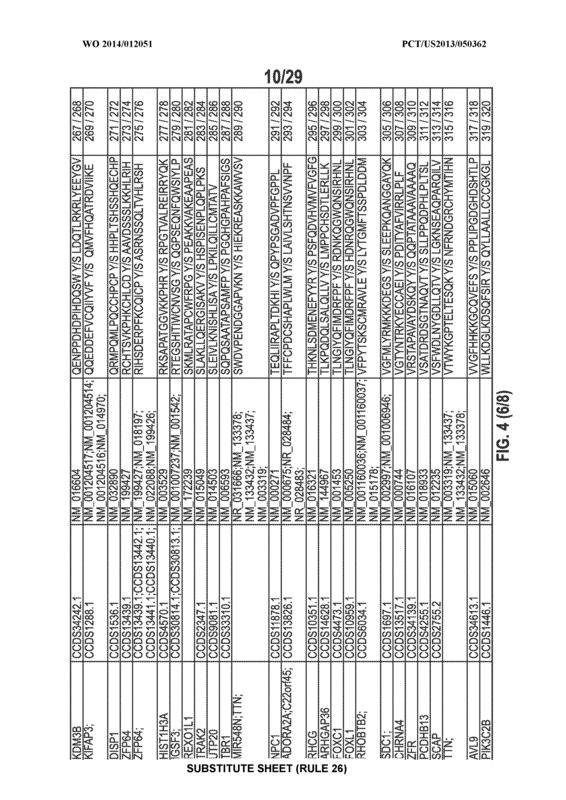 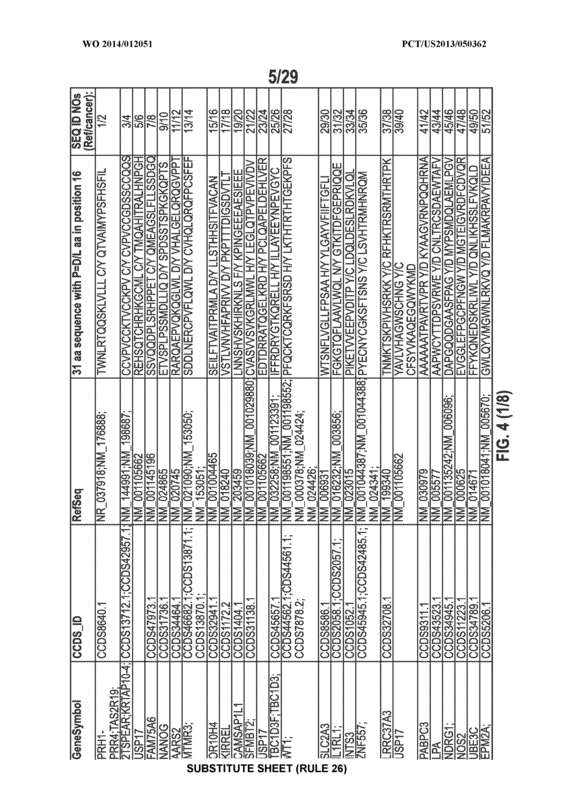 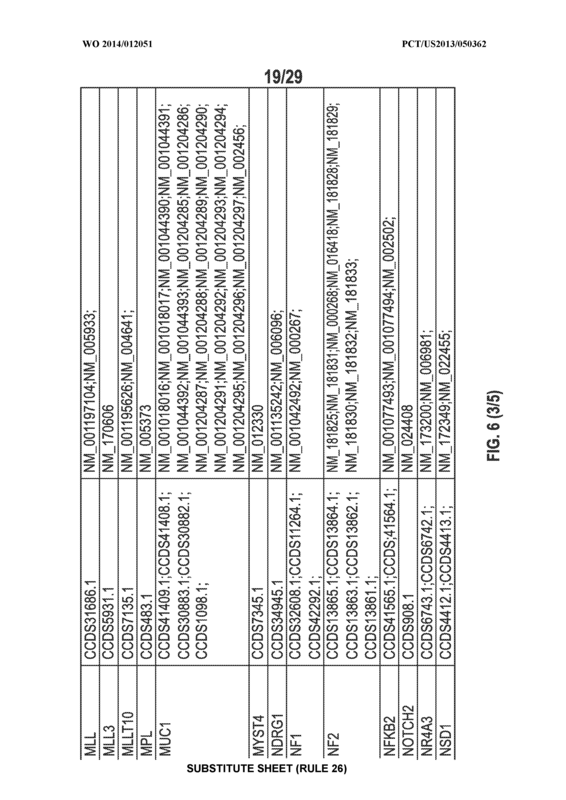 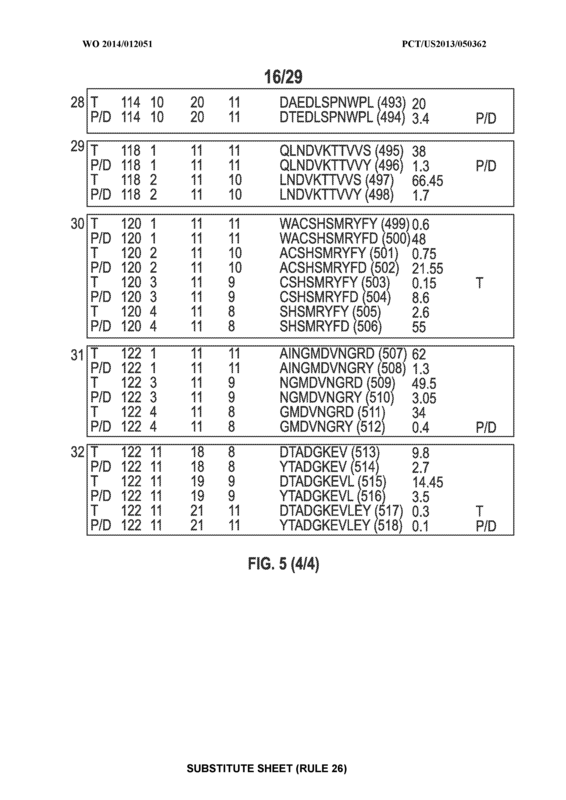 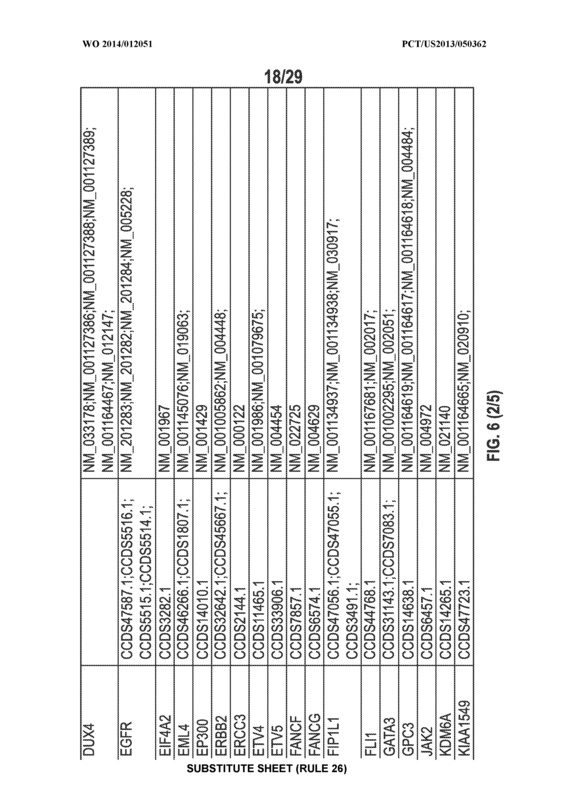 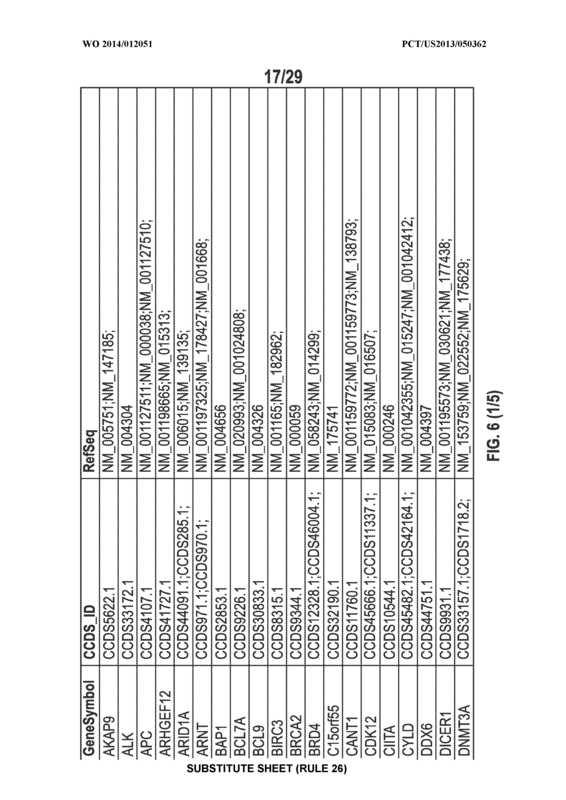 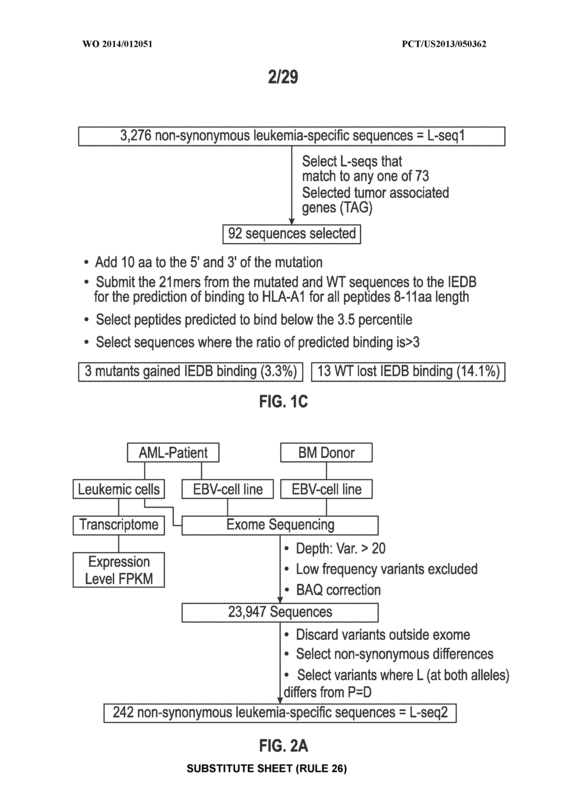 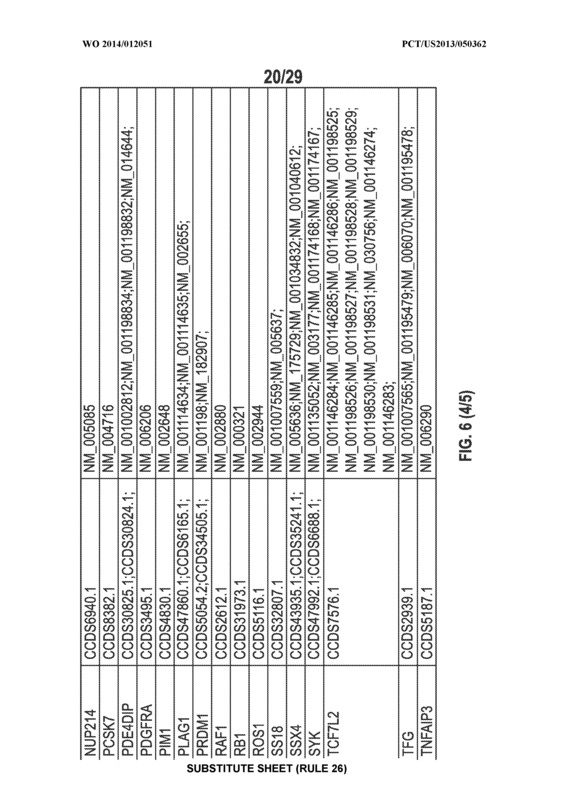 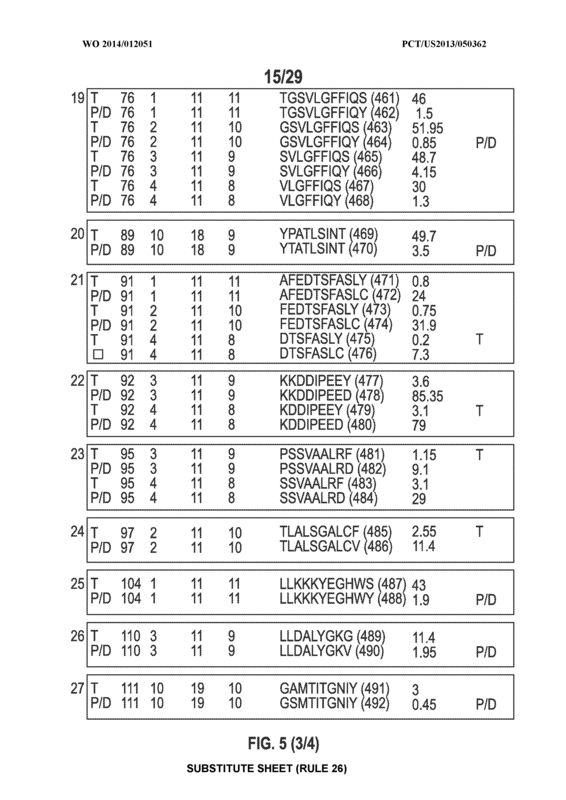 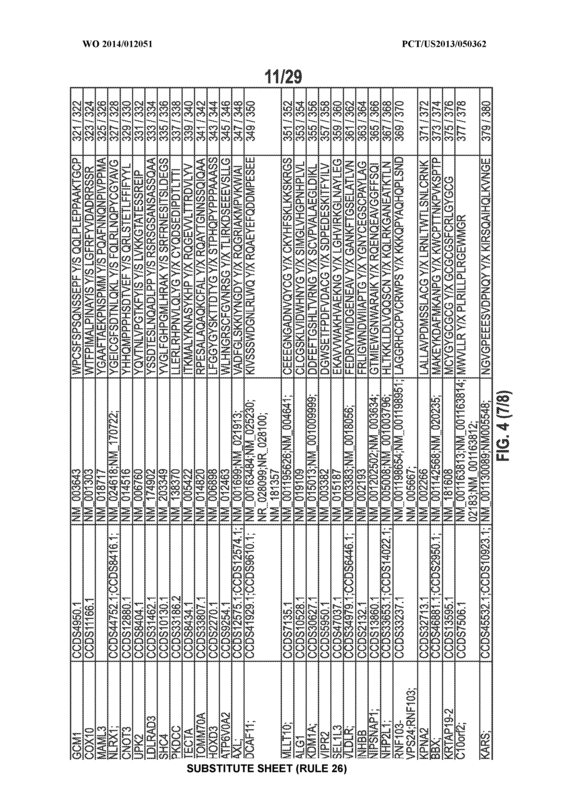 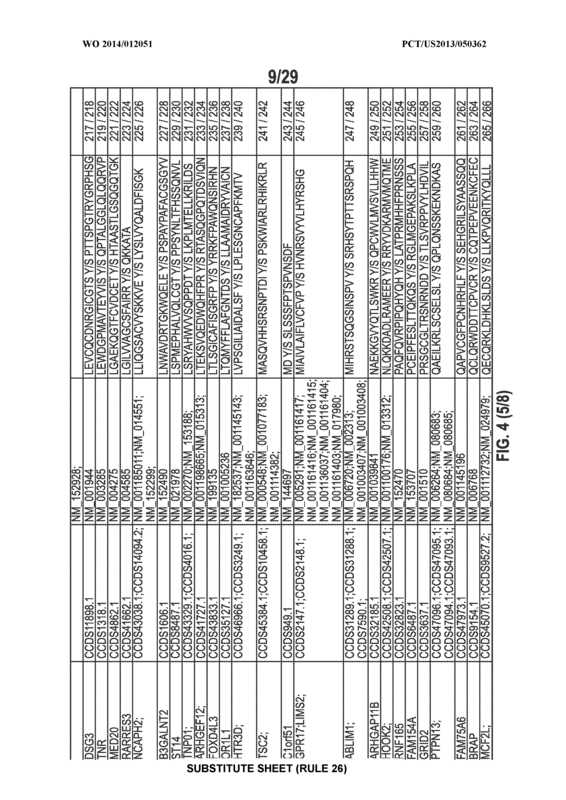 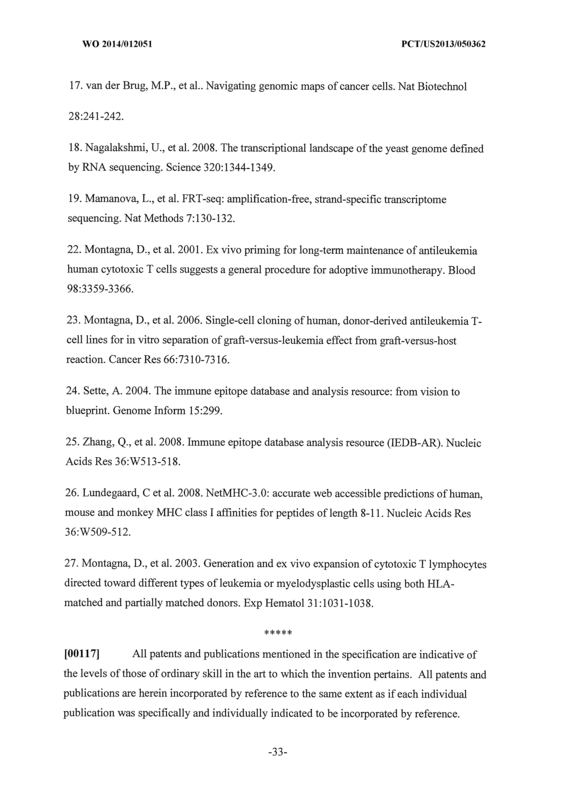 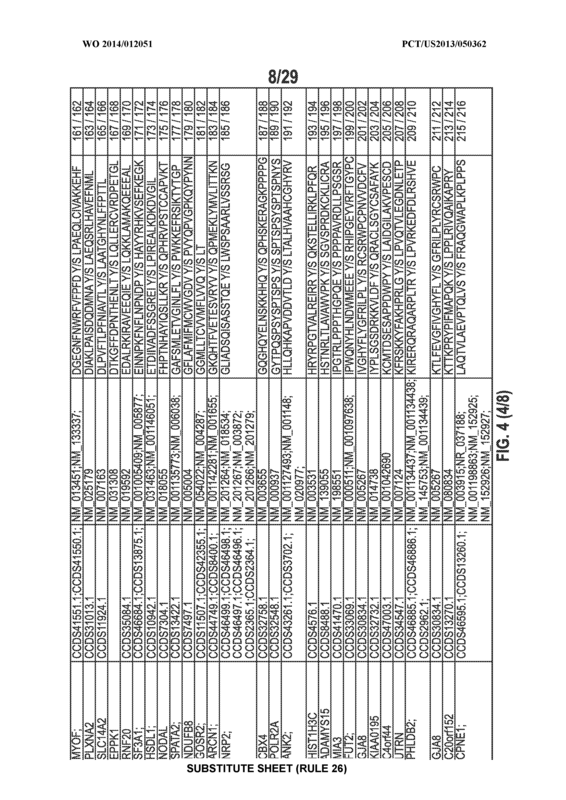 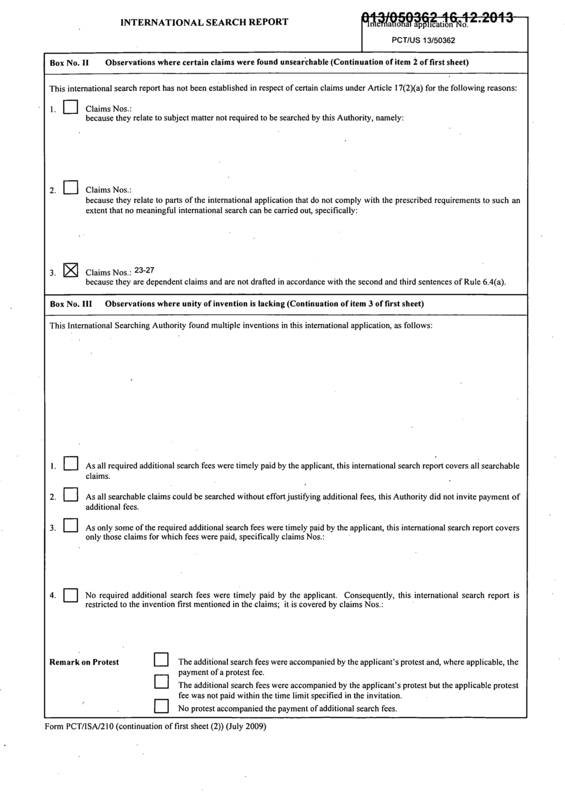 The method of claim 12, wherein the peptides are synthesized comprising translating all or a portion of said mutant sequences from step b) and evaluated for activating cytotoxic T lymphocytes (CTL) cell lines prepared from the cancer patient or from an HLA-matched donor, said CTL cell lines obtained by contacting mononuclear cells from the cancer patient or from the HLA-matched donor with cancer cells from the cancer patient. 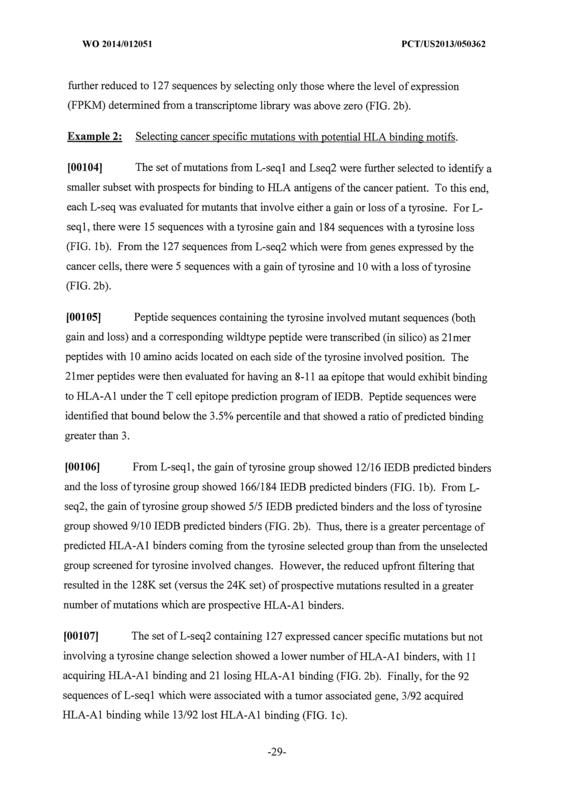 The method of claim 12, wherein peptides comprising the selected sequences from step b) are evaluated for their ability to bind to HLA histocompatibility antigens. 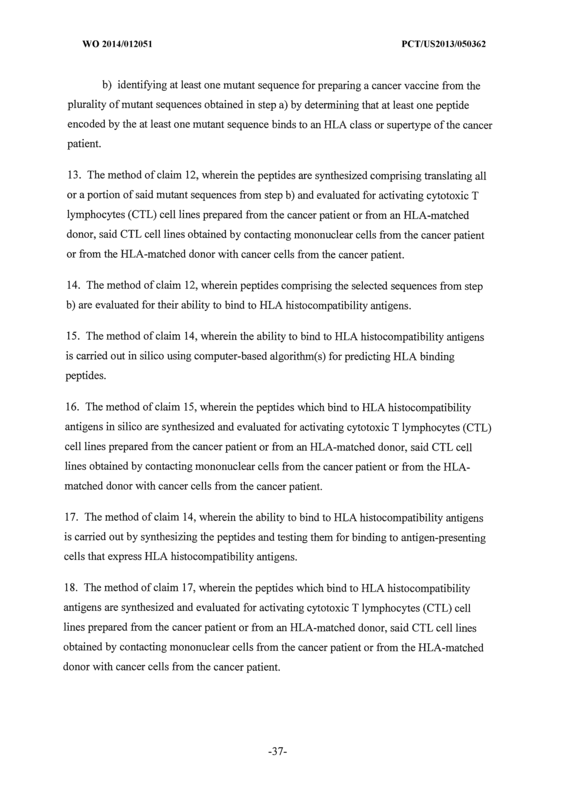 The method of claim 14, wherein the ability to bind to HLA histocompatibility antigens is carried out in silico using computer-based algorithm(s) for predicting HLA binding peptides. 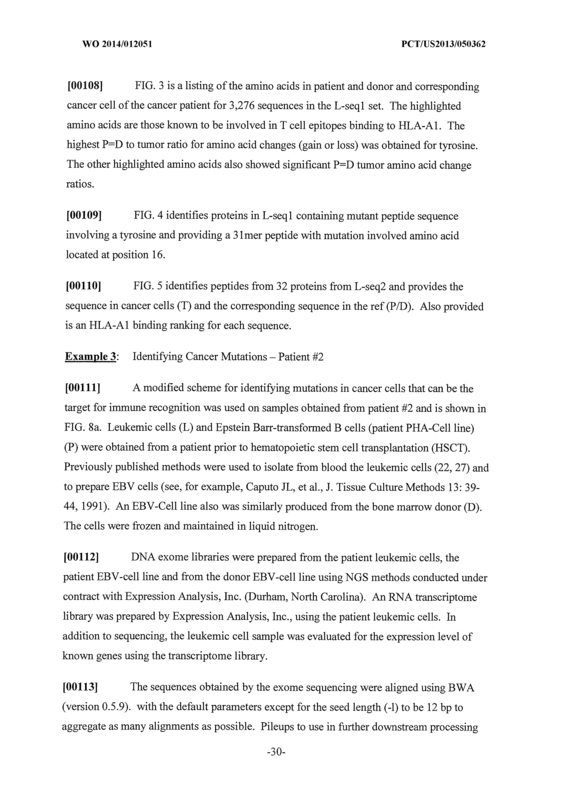 The method of claim 15, wherein the peptides which bind to HLA histocompatibility antigens in silico are synthesized and evaluated for activating cytotoxic T lymphocytes (CTL) cell lines prepared from the cancer patient or from an HLA-matched donor, said CTL cell lines obtained by contacting mononuclear cells from the cancer patient or from the HLA- matched donor with cancer cells from the cancer patient. 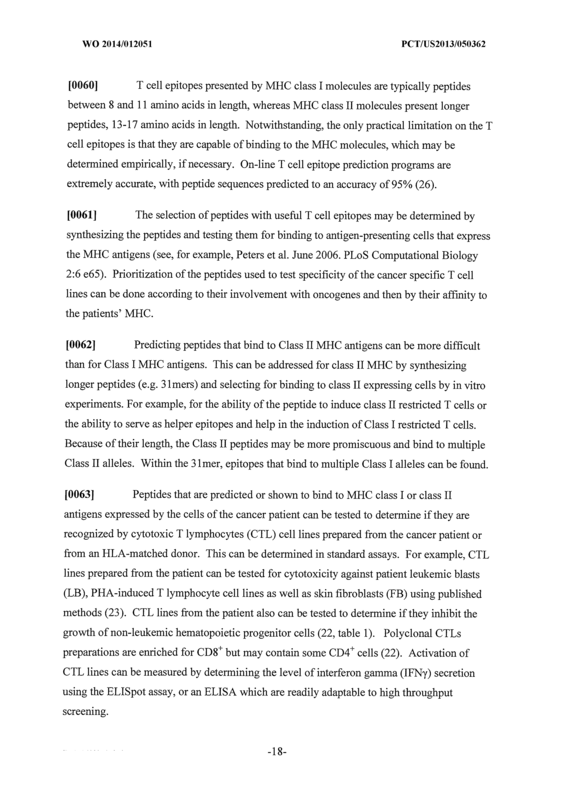 The method of claim 14, wherein the ability to bind to HLA histocompatibility antigens is carried out by synthesizing the peptides and testing them for binding to antigen-presenting cells that express HLA histocompatibility antigens. 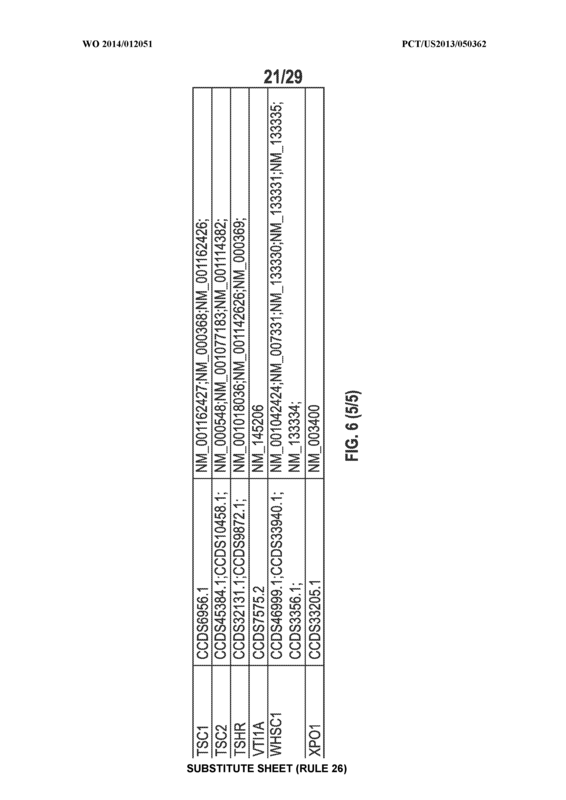 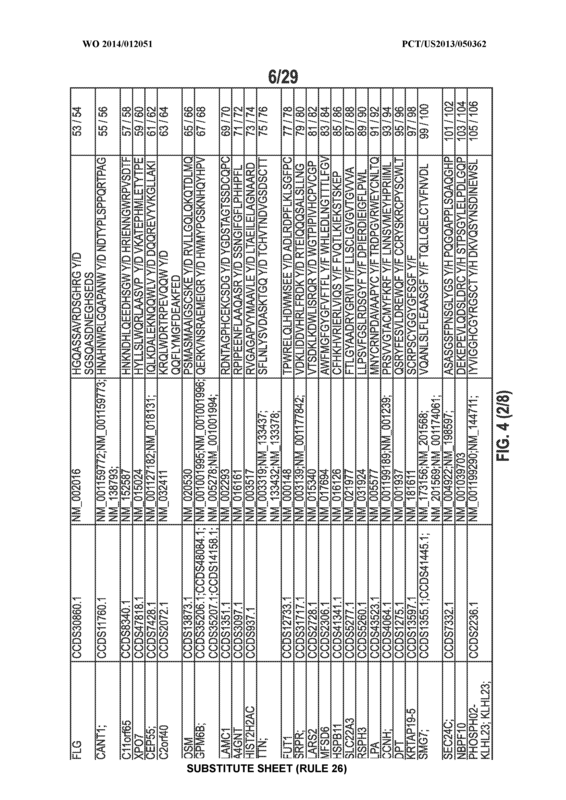 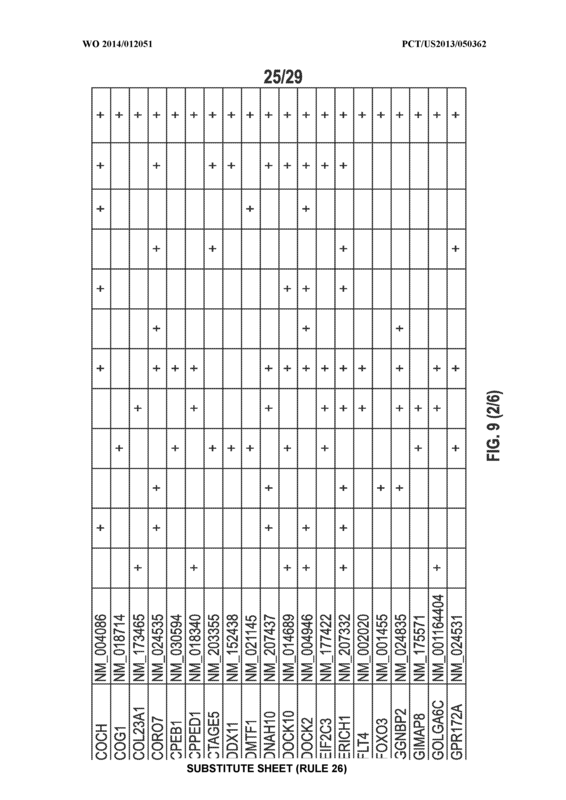 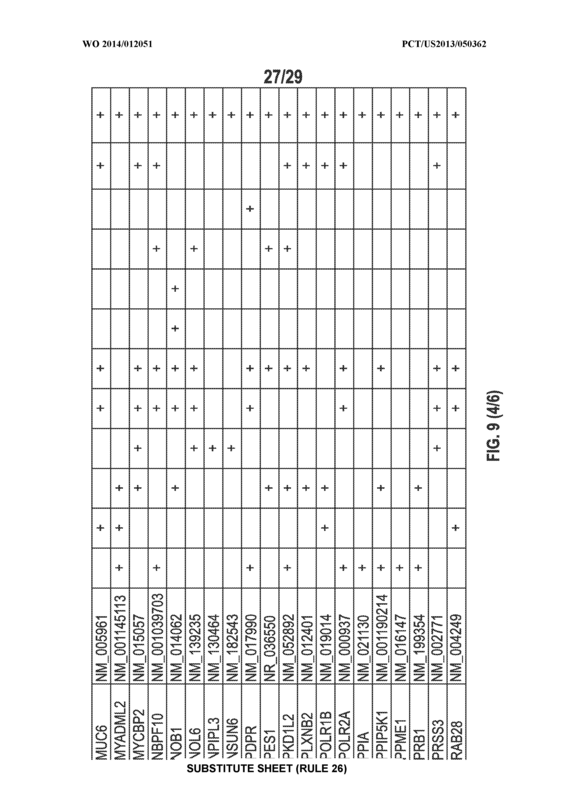 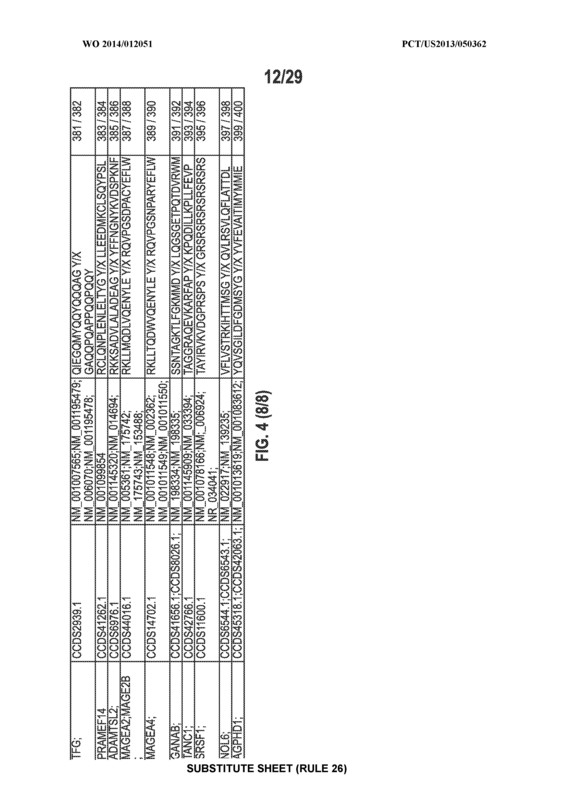 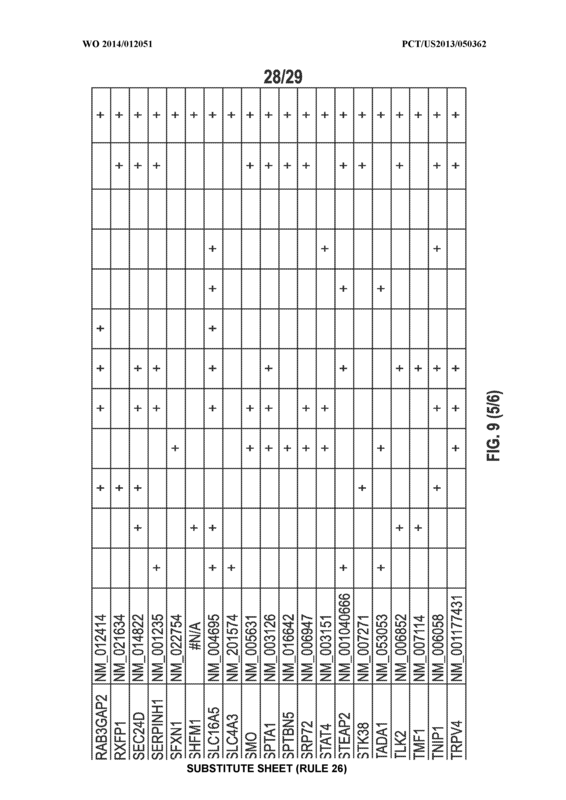 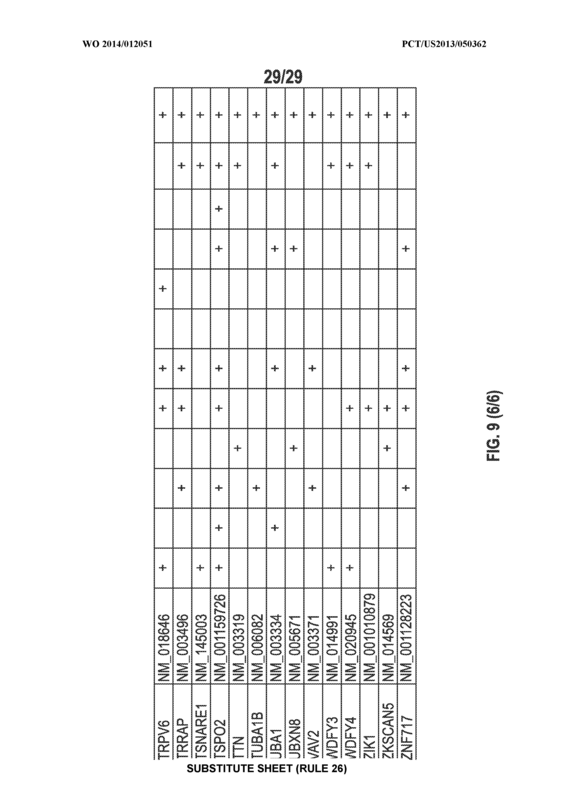 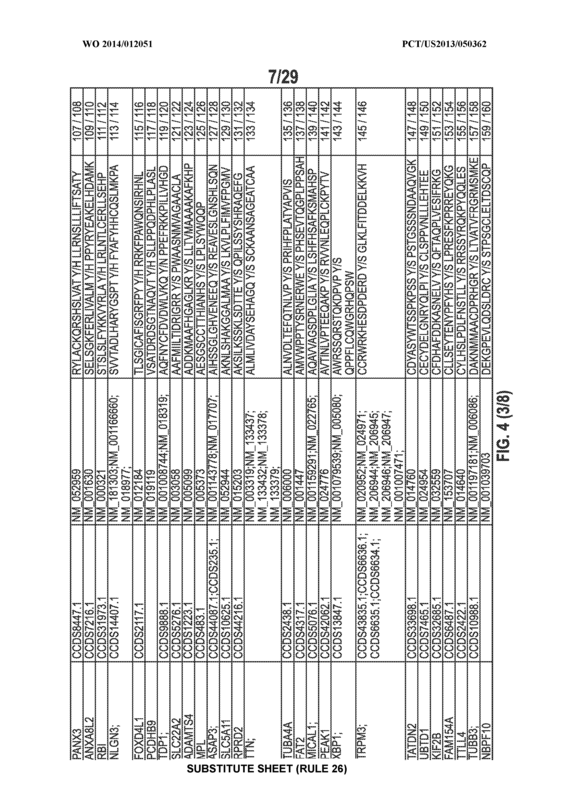 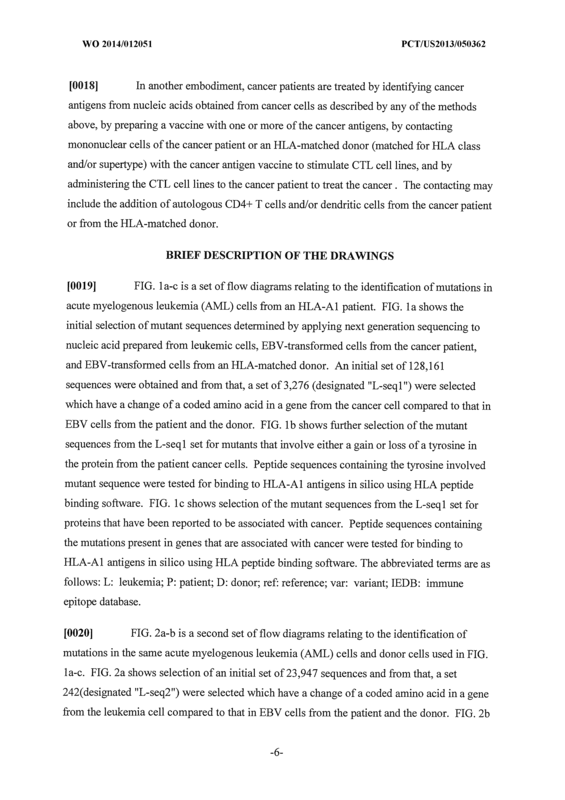 The method of claim 17, wherein the peptides which bind to HLA histocompatibility antigens are synthesized and evaluated for activating cytotoxic T lymphocytes (CTL) cell lines prepared from the cancer patient or from an HLA-matched donor, said CTL cell lines obtained by contacting mononuclear cells from the cancer patient or from the HLA-matched donor with cancer cells from the cancer patient. 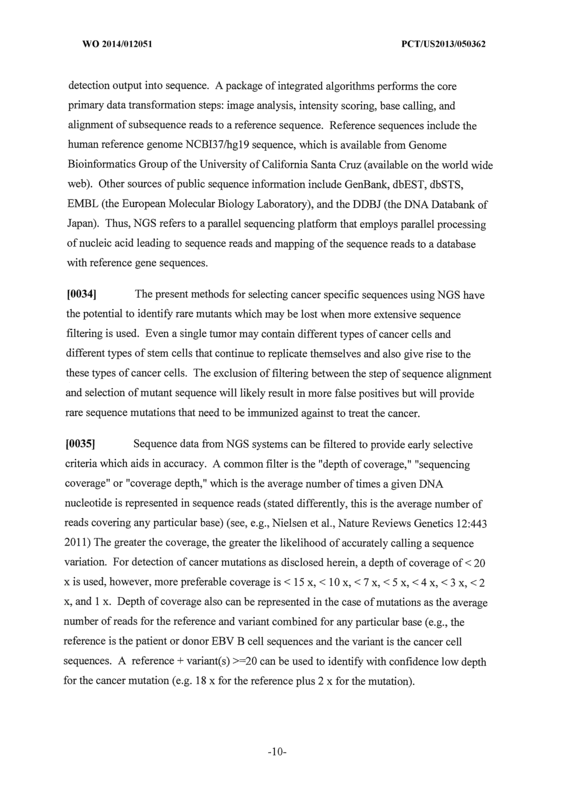 The method of claim 12, wherein said parallel sequencing platform filters the sequencing results using a depth of coverage less than 20 x and/or by not filtering with a base alignment quality (BAQ) algorithm. 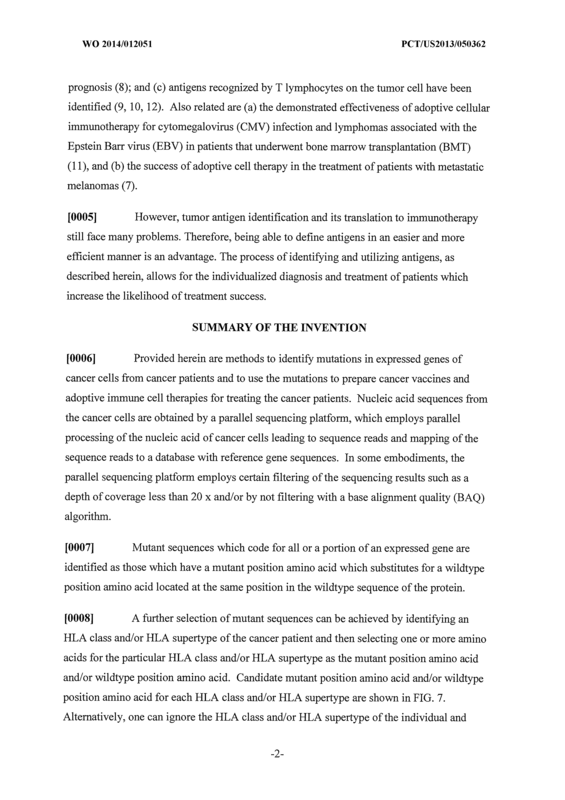 The method of claim 12, wherein the HLA class or supertype is HLA-1 and the mutant amino acid or wildtype amino acid is selected from the group consisting of tyrosine, aspartic acid, glutamic acid, leucine, serine and threonine, and wherein the cancer patient expresses the HLA-A1 histocompatibility antigen. 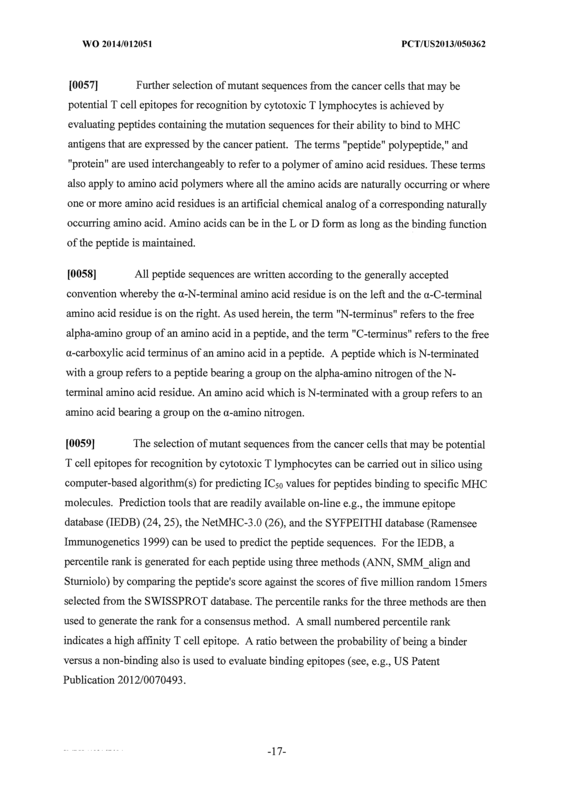 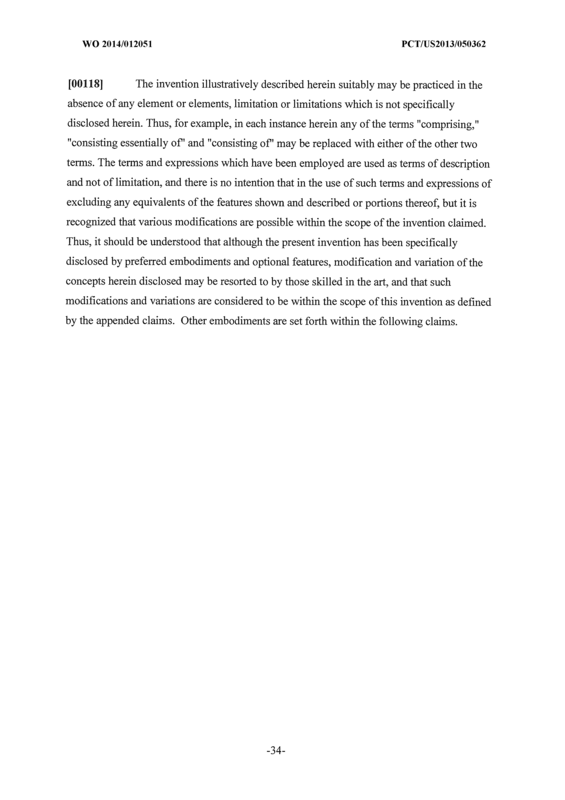 The method of any of claims 13, 16 and 18, wherein said mononuclear cells are enriched in CD8+ cells. 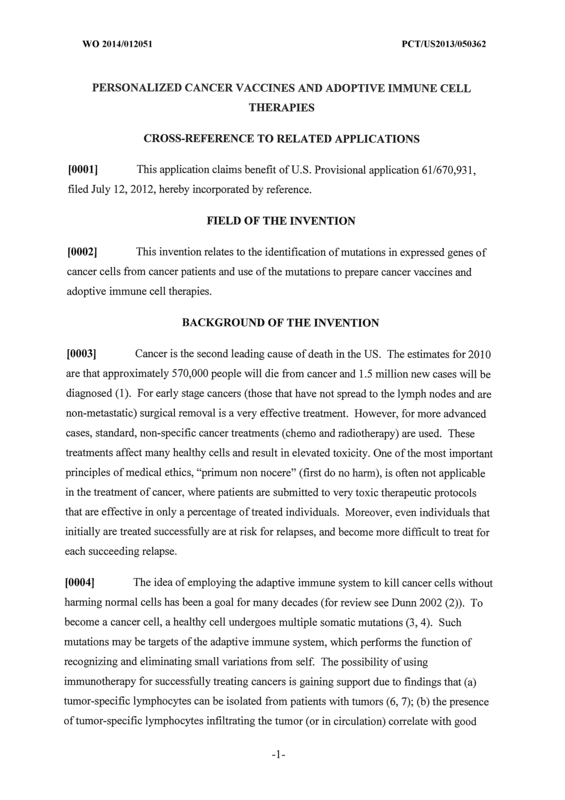 The method of any of claim 13, 16 and 18, wherein said contacting further includes the addition of autologous CD4+ T cells and/or dendritic cells from the cancer patient or autologous CD4+ T cells and/or dendritic cells from the HLA-matched donor. 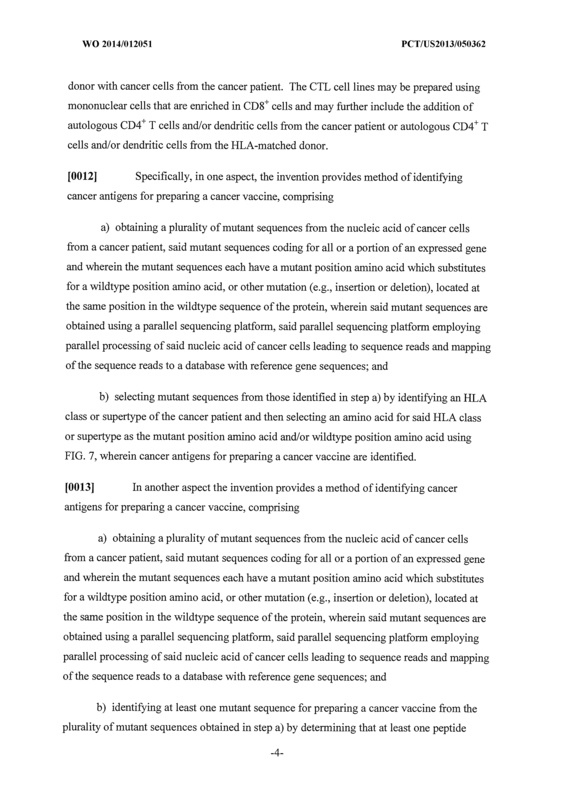 A cancer vaccine prepared using one or more of the cancer antigens identified using the methods of any of claims 1-22. 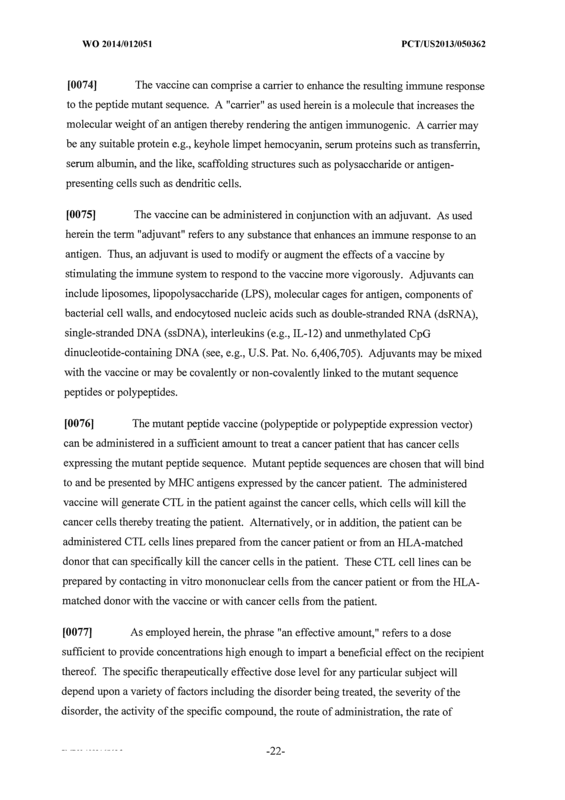 The cancer vaccine of claim 23, which is a polypeptide that comprises one or more of the cancer antigens. 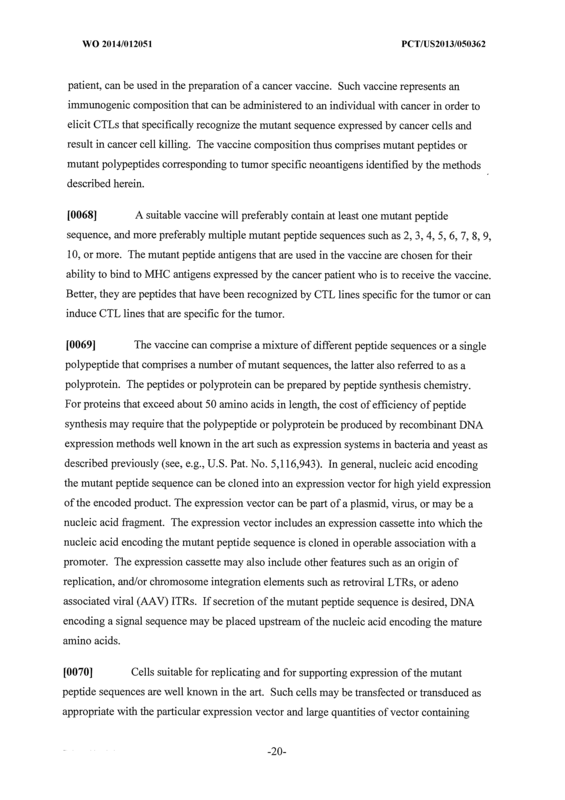 The cancer vaccine of claim 23, which is a nucleic acid that encodes for expression of one or more of the cancer antigens. 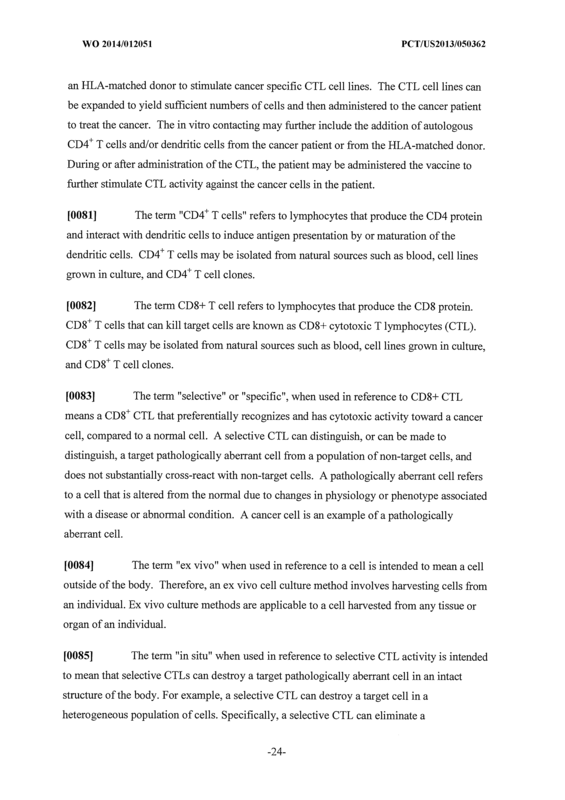 lymphocytes (CTL) against the cancer cells; and/or d) administering CTL cell lines prepared from the cancer patient or from an HLA- matched donor, wherein said CTL cell lines are i) prepared by contacting in vitro blood mononuclear cells from the cancer patient or from the HLA-matched donor with the vaccine; or ii) prepared by immunizing the donor with the vaccine and transferring immunized donor CTLs to the cancer patient. 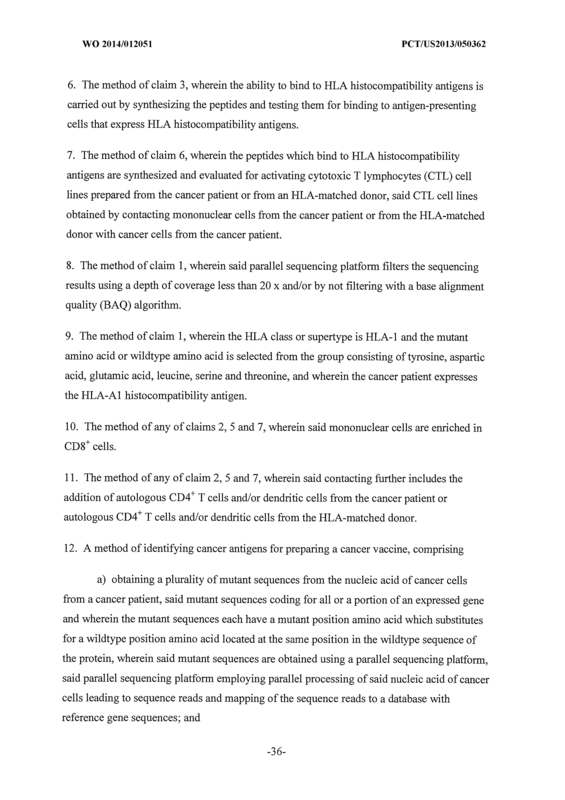 The method of claim 26, wherein said contacting further includes the addition of autologous CD4+ T cells and/or dendritic cells from the cancer patient or from the HLA- matched donor. 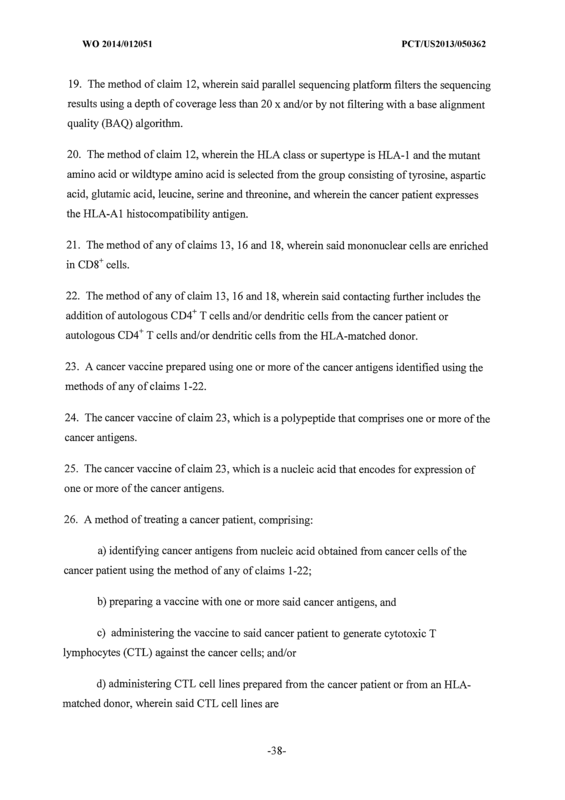 A method of treating a cancer patient, comprising: a) identifying cancer antigens from nucleic acid obtained from cancer cells of the cancer patient using the method of claims 1, 4, 12, or 15; b) contacting T cells from the patient or from an HLA-matched donor with the cancer antigens in vitro to stimulate cancer specific cytotoxic T lymphocyte (CTL) cell lines; and c) administering the CTL cell lines to the cancer patient treat the cancer. 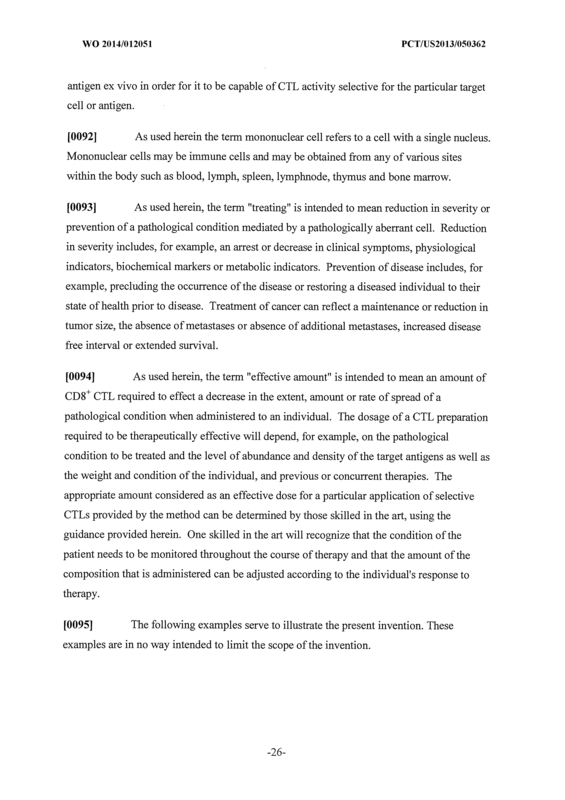 The method of claim 28, wherein said contacting further includes the addition of autologous CD4+ T cells and/or dendritic cells from the cancer patient or autologous CD4+ T cells and/or dendritic cells from the HLA-matched donor.